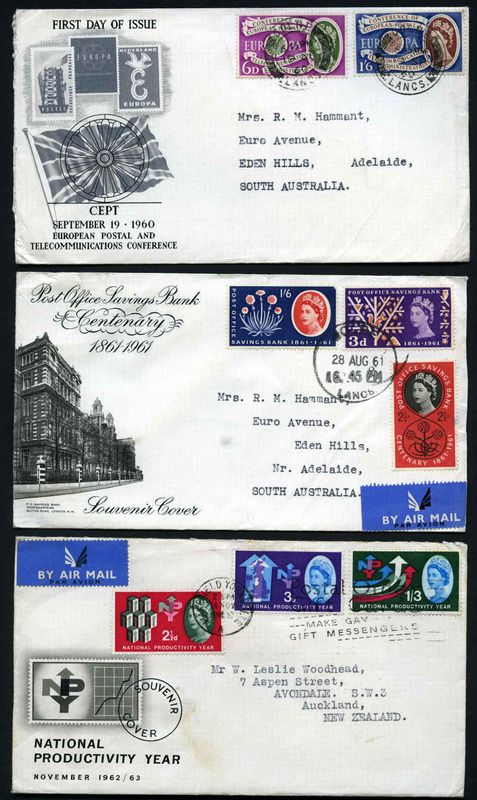 Selection of 132 different addressed Pre-Decimal illustrated FDC's from 1936 to 1965 including 1936 Cable set, 1936 SA Centenary set, 1937 NSW Sesqui set, 1940 AIF set, 1946 Mitchell set, 1947 Newcastle set, 1948 1/3 Bull and 2/- Aboriginal Art, 1949 1/6 Hermes, 1952 1/0½d KGVI and 2/6 Aborigine, 1953 Food strips of 3 set, 1953 Coronation set, 1953 Tasmania Sesqui set, 1954 Royal Visit set, 1954-55 2/- Blue and 2/- Green Olympic Games, 1955 Cobb and Co set, 1955-57 QEII Definitive set, 1956 Melbourne Olympics set, 1958 2/- Qantas, 1958 5½d War Memorial pair, 1959-64 Flower set, 1959-62 Animal set, 1961 5/- Cream Paper Cattle, 1963 Commonwealth Games set, 1963 Royal Visit set, 1964 10/- and £1 Navigators, 1963 2/3 Cable, 1964-65 Birds set of 7, 1964 Airmail set and 1965 Anzac set. 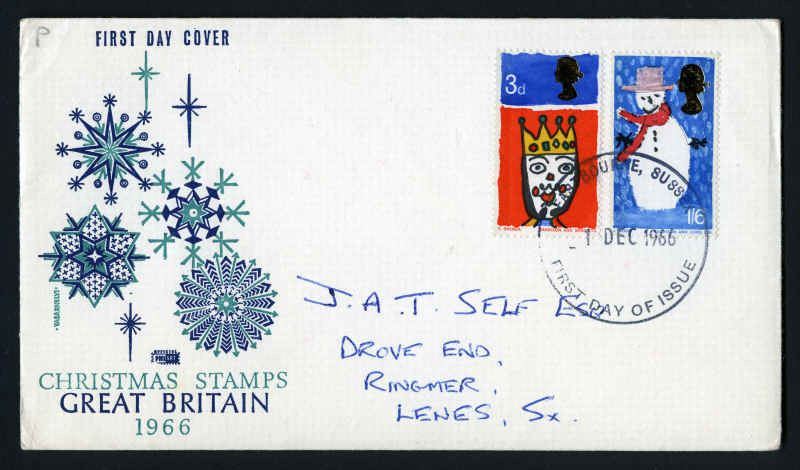 Odd minor blemish and many typed addressed covers. High retail value. 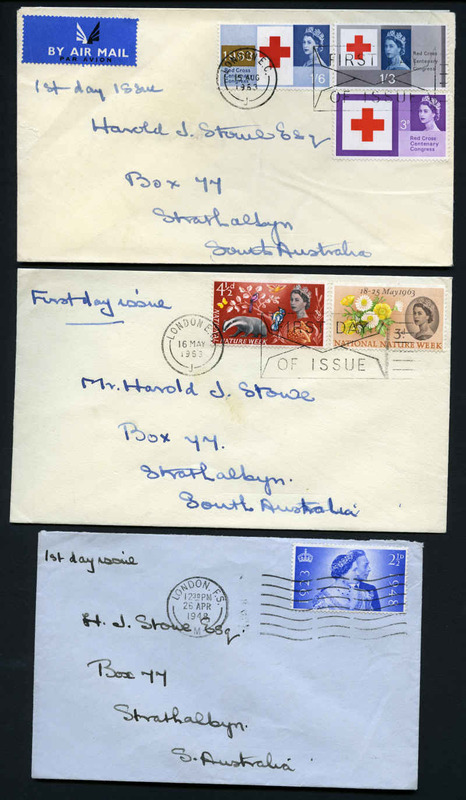 Selection of 114 addressed Pre-Decimal illustrated registered FDC's from 1936 to 1965 including 1936 Cable set, 1936 SA Centenary set (2), 1937 NSW Sesqui set (3), 1940 AIF set (3), 1945 Gloucester set, 1946 Peace set, 1946 Mitchell set, 1948 2/- Aboriginal Art (Bodin cover), 1951 Federation set (2), 1952 1/0½d KGVI (3), 1952 2/6 Aborigine (2), 1953 Coronation set, 1953 Tasmania Sesqui set, 1954 Royal Visit set (2), 1954-55 2/- Blue and 2/- Green Olympic Games, 1955 Cobb and Co set, 1956 Melbourne Olympics set, 1961 5/- Cream Paper Cattle, 1963 Commonwealth Games set, 1963 Royal Visit set, 1964 7/6 and 10/- Navigators, 1963 2/3 Cable, 1964-65 Birds set of 7, 1964 Airmail set and 1965 Anzac set. 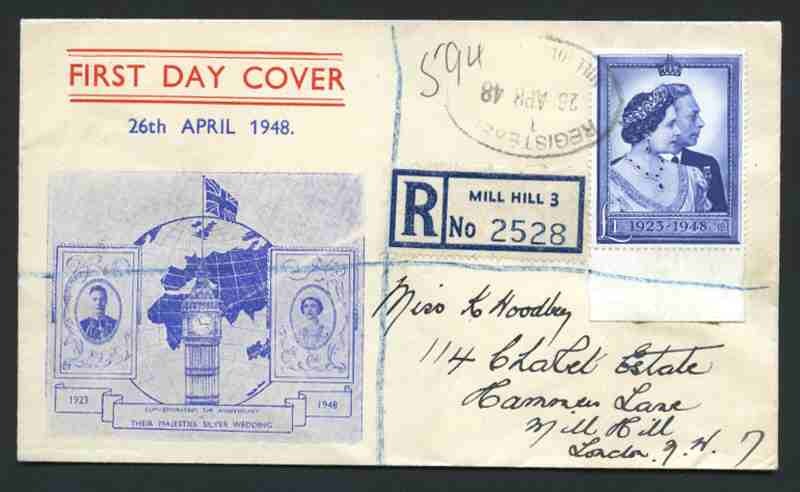 Odd minor blemish and many typed addressed covers. Very high retail value. 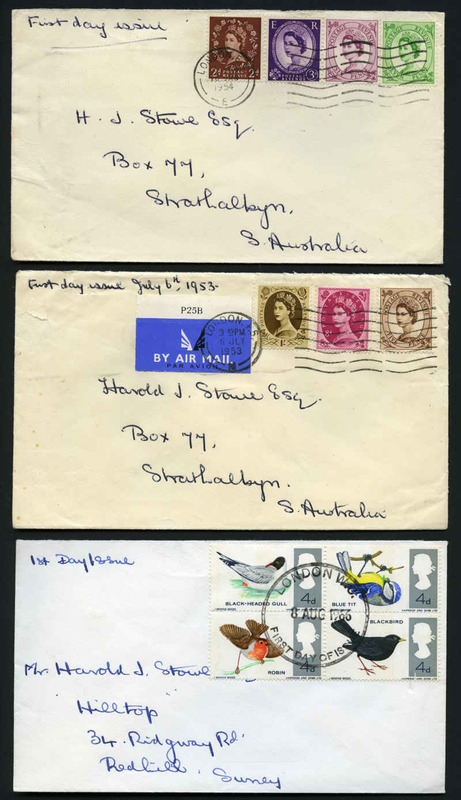 Selection of 131 different addressed Pre-Decimal illustrated FDC's from 1937 to 1965 including 1937 NSW Sesqui set, 1938 9d Perf 13½ Platypus, 1940 AIF set, 1946 Mitchell set, 1947 Newcastle set, 1948 1/3 Bull and 2/- Aboriginal Art, 1952 1/0½d KGVI and 2/6 Aborigine, 1953 Food strips of 3 set, 1953 Coronation set, 1953 Tasmania Sesqui set, 1954 Royal Visit set, 1954-55 2/- Blue and 2/- Green Olympic Games, 1955 Cobb and Co set, 1955-57 QEII Definitive set, 1956 Melbourne Olympics set, 1958 2/- Qantas, 1958 5½d War Memorial pair, 1959-64 Flower set, 1959-62 Animal set, 1961 5/- Cream Paper Cattle, 1963 Commonwealth Games set, 1963 Royal Visit set, 1963-64 Navigator set to £1 value, 1963 2/3 Cable, 1964-65 Birds set of 7, 1964 Airmail set and 1965 Anzac set. 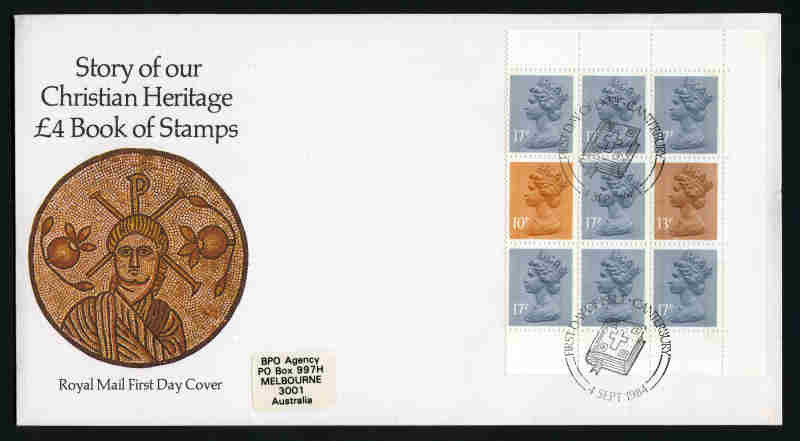 Odd minor blemish and many typed addressed covers. High retail value. 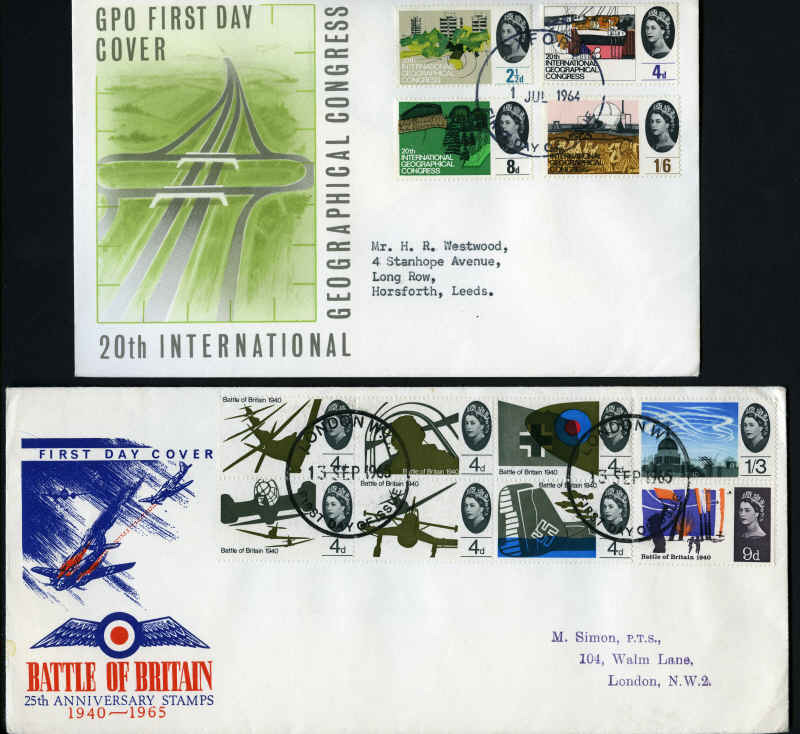 Collection of 504 mainly low value addressed Pre-Decimal illustrated FDC's from 1947 to 1965 all with different variations of cover types including WCS, Wide World, Mappin and Curran and Royal. 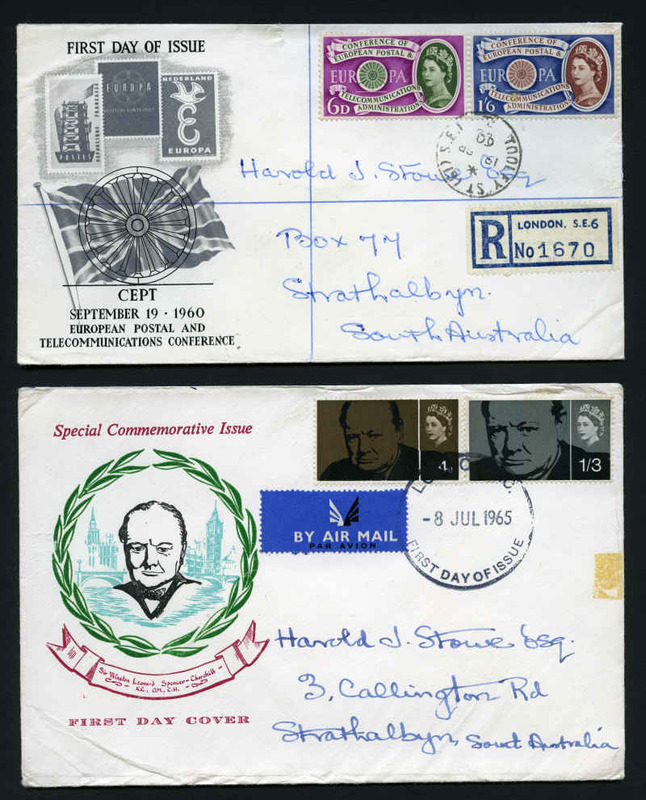 Noted 1946 Peace set, 1947 Newcastle set, 1949 1/6 Hermes, 1951 Federation set (2), 1952 1/0½d and 2/6 Aborigine, 1953 Coronation set (8), 1953 Food strips of 3 set (3), 1953 Tasmania Sesqui set (4), 1954 Royal Visit set (4), 1954-55 2/- Blue (5) and 2/- Green (3) Olympic Games, 1955 Cobb and Co set (3), 1956 Melbourne Olympics (2), 1958 2/- Qantas (2), 1958 5½d War Memorial pair (4), 1959-64 Flower set (2), 1959-62 Animals set (2), 1961 5/- Cream Paper Cattle (3), 1963 Commonwealth Games set (2), 1963 Royal Visit set (2), 1963 2/3 Cable (6), 1964-65 Bird set of 7, 1964 Airmail set (5), 1965 Anzac set (4) and 1965 2/3 ICY (7). Odd minor blemish. Very high retail value. 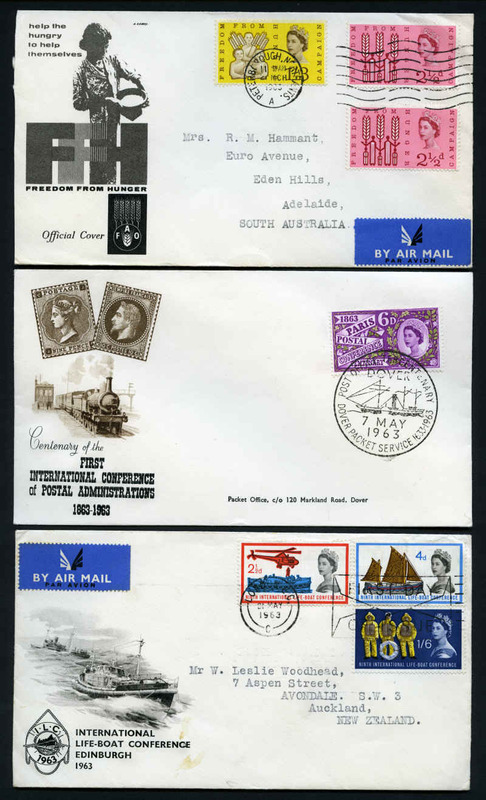 Selection of 101 different unaddressed Pre-Decimal illustrated FDC's from 1949 to 1965 including 1952 1/0½d KGVI, 1953 Food strips of 3 set, 1953 Tasmania Sesqui set, 1954 Royal Visit set, 1954-55 2/- Blue and 2/- Green Olympic Games, 1955 Cobb and Co set, 1956 Melbourne Olympics set, 1958 5½d War Memorial pair, 1959-64 Flower set, 1959-62 Animal set, 1963 Commonwealth Games set, 1963 Royal Visit set, 1963 2/3 Cable, 1964-65 Birds set of 7, 1964 Airmail set and 1965 Anzac set. High retail value. 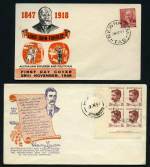 Accumulation of 412 Pre-Decimal and 738 Decimal mainly lower value FDC's from 1950 to 1991 including few better issues and numerous duplicates. 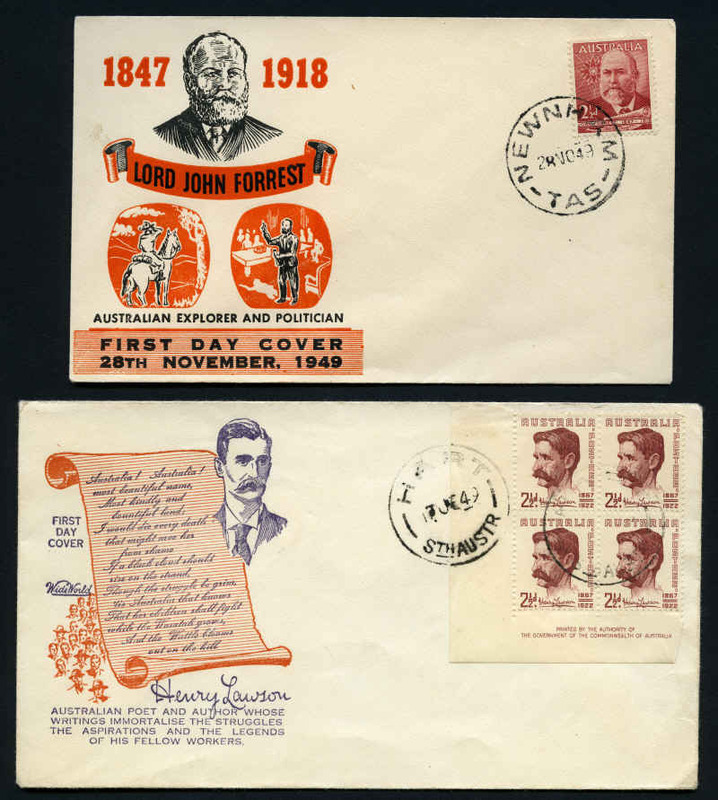 Some covers with marked backs caused by photo album. 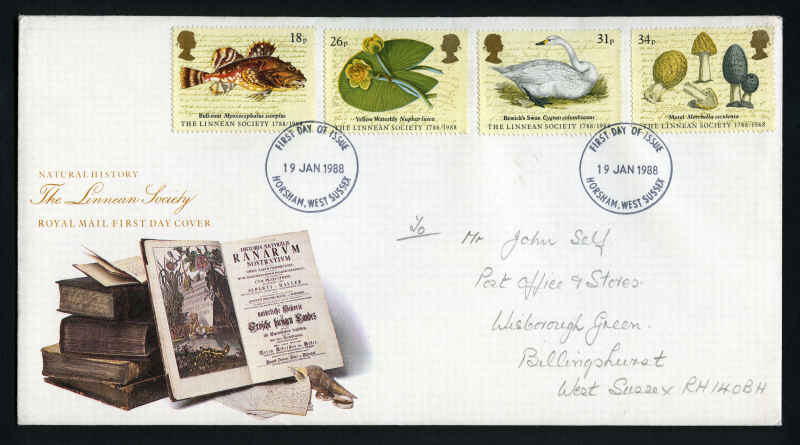 1953 3½d Antarctic Exploration A.J. 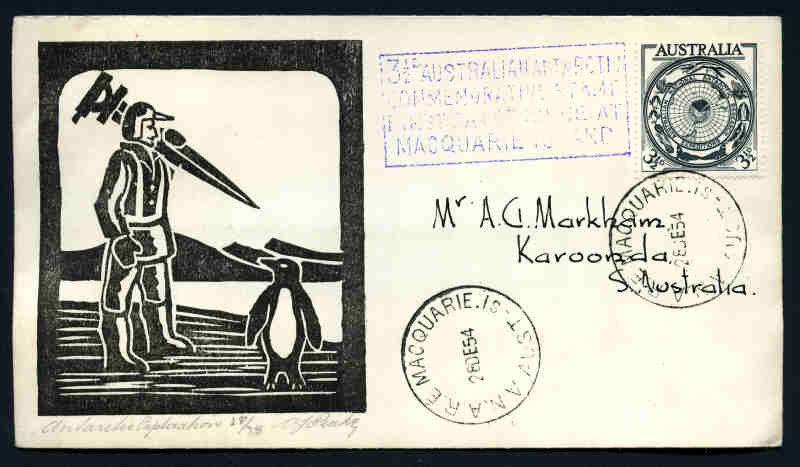 Peake Woodblock FDC cancelled at Macquarie Island and addressed to Karoonda. Numbered 28 of 35? and signed by the Artist. 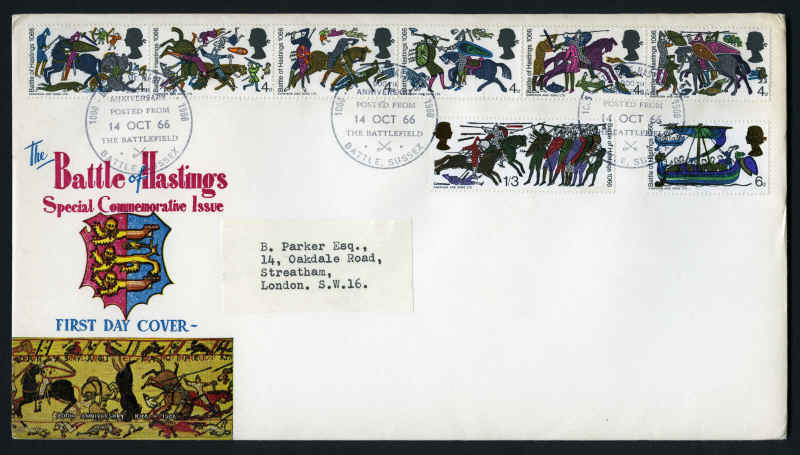 Selection of 32 Pre-Decimal and 42 Decimal illustrated FDC's from 1959 to 1970, official unaddressed FDC's from 1970 to 1973, plus 23 covers cancelled with special postmarks including useful and better items. Also a selection of later official unaddressed FDC's with a Face Value of $117.00. 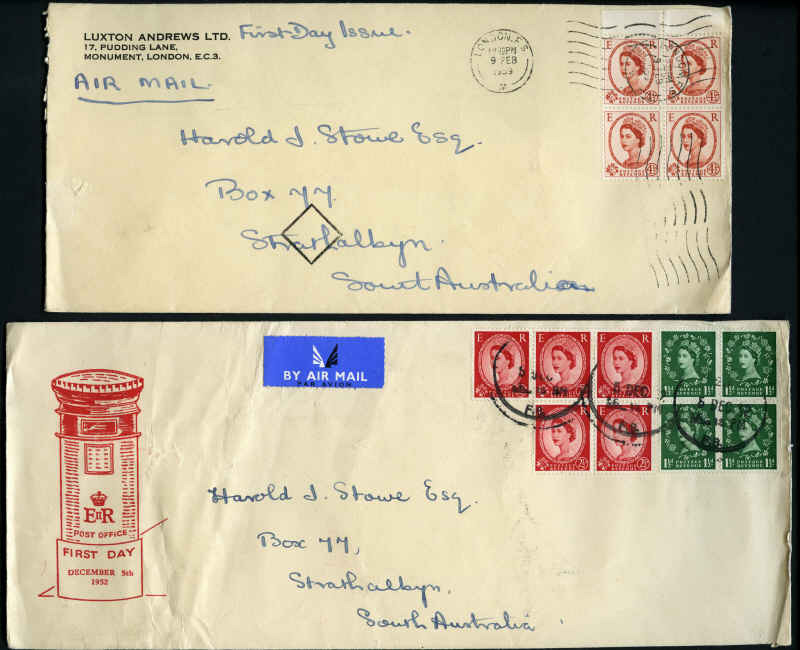 Accumulation of 390 mainly low value addressed Pre-Decimal illustrated FDC's from 1937 to 1965 including many duplicates. 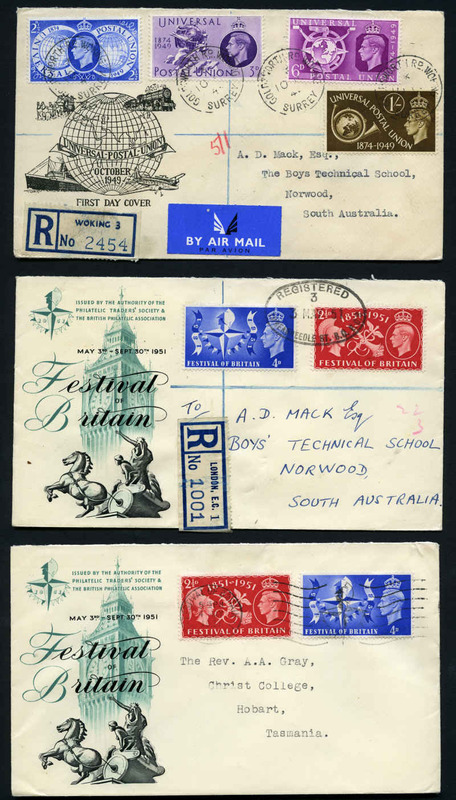 Noted 1940 AIF set (2), 1947 Newcastle set (4), 1948 1/3 Bull, 1953 Food strips of 3 set (8), 1955 Cobb and Co set (3), 1955 2/- Green Olympic Games (2), 1959-64 Flower set, 1959-62 Animals set, 1961 5/- Cream Paper Cattle, 1963 Commonwealth Games set, 1963 Royal Visit set, 1963 2/3 Cable (3), 1964 Airmail set (2) and 1965 Anzac set (2). Some generally minor faults and blemishes. 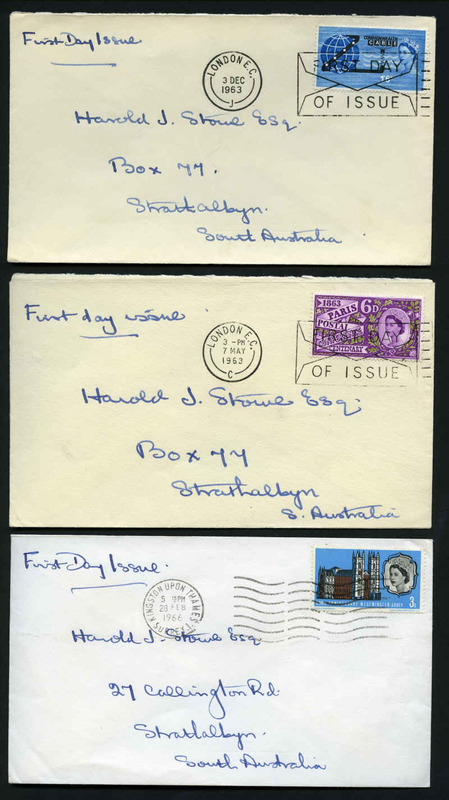 Accumulation of 405 mainly low value addressed Pre-Decimal illustrated FDC's from 1937 to 1965 including many duplicates. 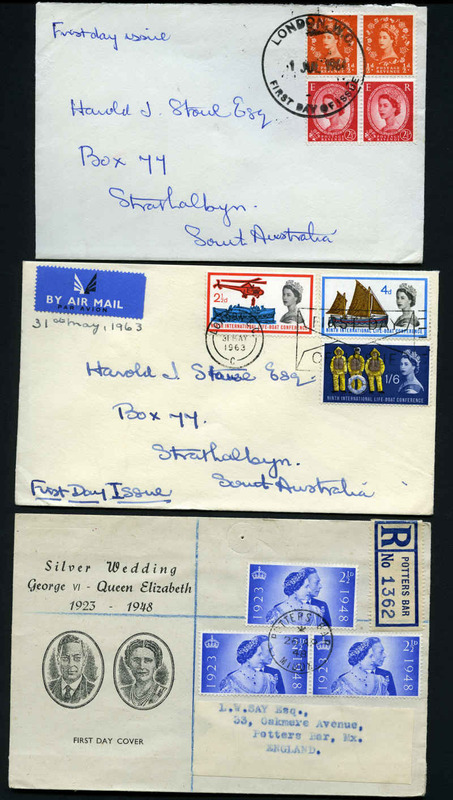 Noted 1940 AIF set (2), 1947 Newcastle set (2), 1949 1/6 Hermes, 1953 Food strips of 3 set (9), 1953 Coronation set (2), 1953 Tasmania Sesqui set (2), 1954-55 2/- Blue and 2/- Green (2) Olympic Games, 1955 Cobb and Co set (4), 1955-57 QEII Definitive set (2), 1959-64 Flower set, 1959-62 Animals set, 1961 5/- Cream Paper Cattle, 1963 Commonwealth Games set (2), 1963 Royal Visit set (3), 1963 2/3 Cable (4), 1964 Airmail set (2), 1965 Anzac set (3) and 1965 2/3 ICY (2). Some generally minor faults and blemishes. 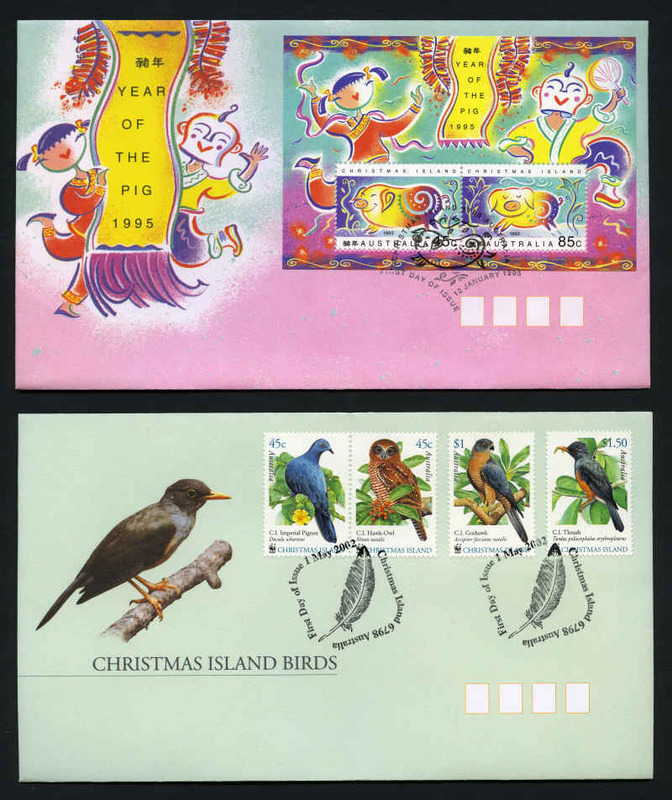 Accumulation of 300 mainly low value unaddressed Pre-Decimal illustrated FDC's from 1947 to 1965 including many duplicates. 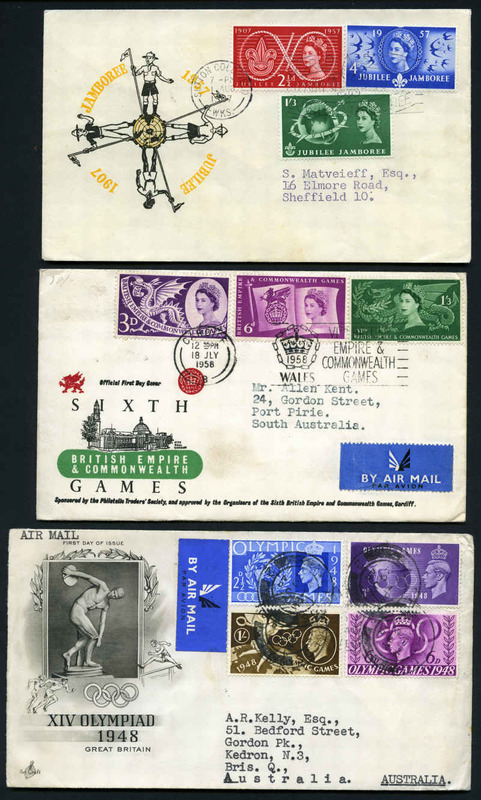 Noted 1953 Food strips of 3 set (2), 1954 Royal Visit set, 1954-55 2/- Blue (3) and 2/- Green Olympic Games, 1958 War Memorial pair (2), 1959-64 Flower set, 1963 Commonwealth Games set (4), 1963 Royal Visit set (3), 1963 2/3 Cable (3), 1964-65 Bird set of 7 (3), 1964 Airmail set (4), 1965 Anzac set and 1965 2/3 ICY (3). Mainly WCS and Royal covers. Odd minor blemish. Very high retail value. 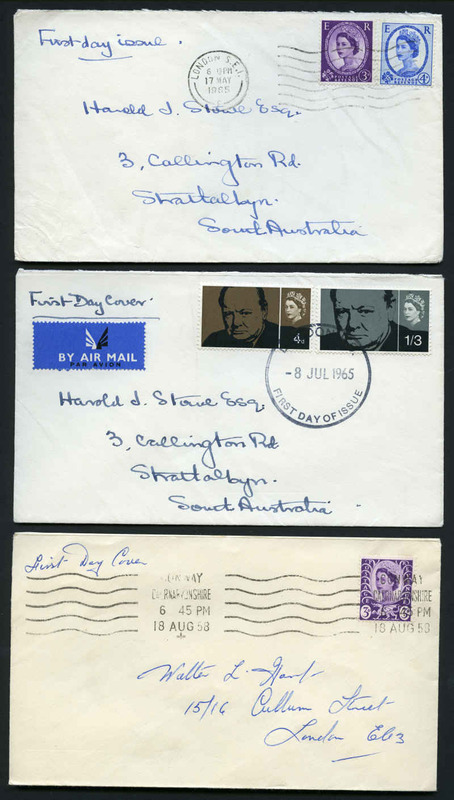 Selection of 86 mainly low value addressed Pre-Decimal illustrated FDC's from 1946 to 1960 including few AAT, souvenir covers and some duplication. 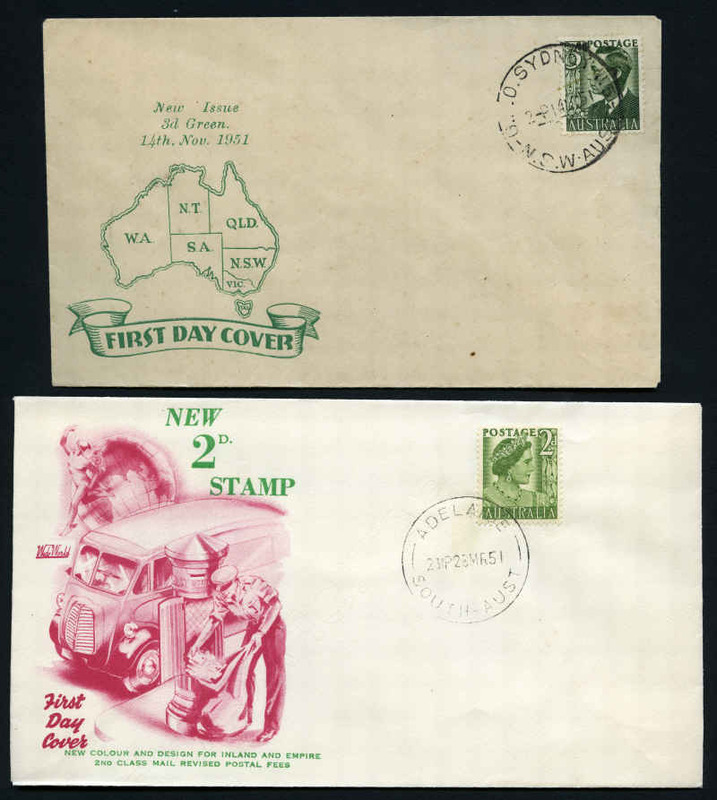 Also small range of covers including 7 early Australia and New Zealand First Flight covers. 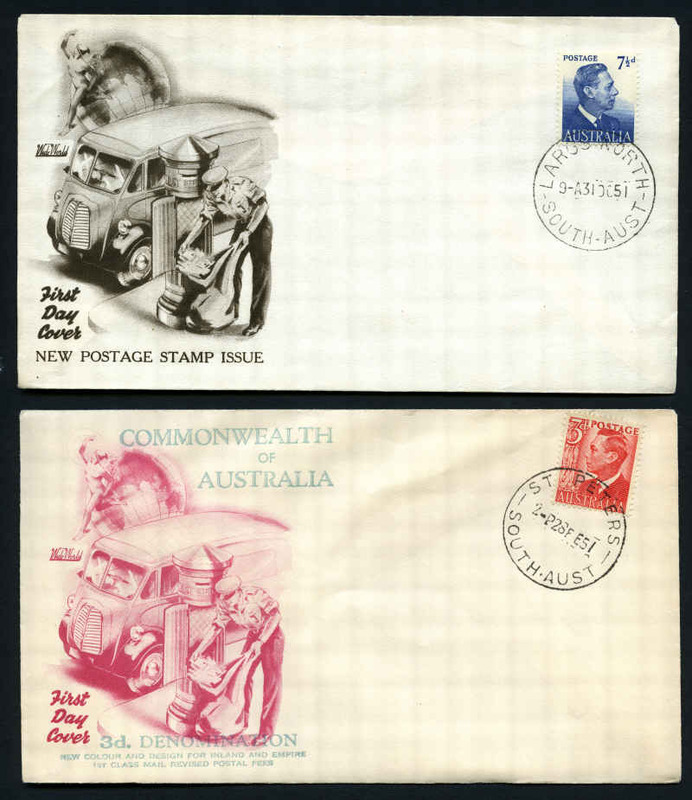 Accumulation of 450 illustrated Decimal FDC's from 1966 to 1975 including 1966 Definitive set of 24 on typed addressed Australia Post logo covers (2) and 1970 30¢ Cook on small official unaddressed FDC with additional single 5¢ value attached and many more. 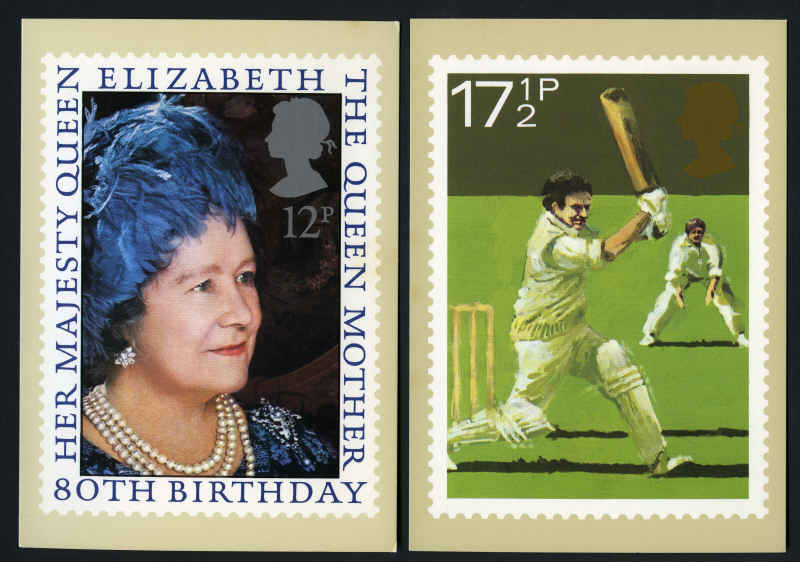 Majority addressed WCS and Royal covers with many duplicates. Odd minor blemish. 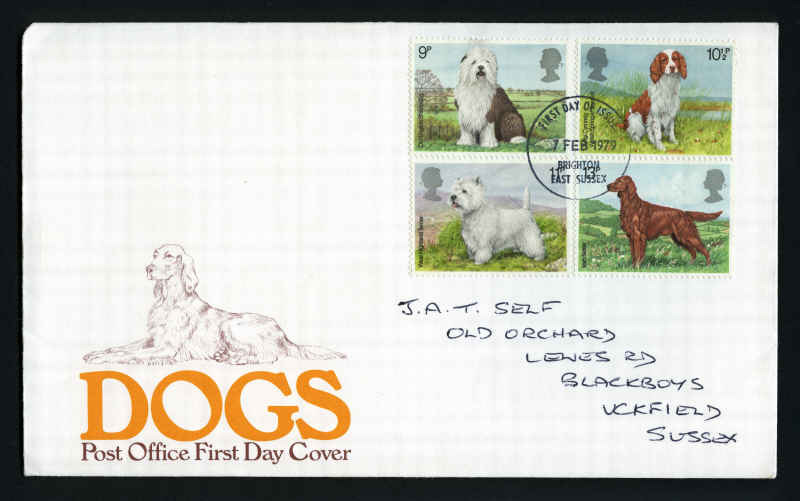 Collection of official unaddressed FDC's from 1975 to 2008 including some booklet panes and joint issues. No duplication. Face Value $813.00. 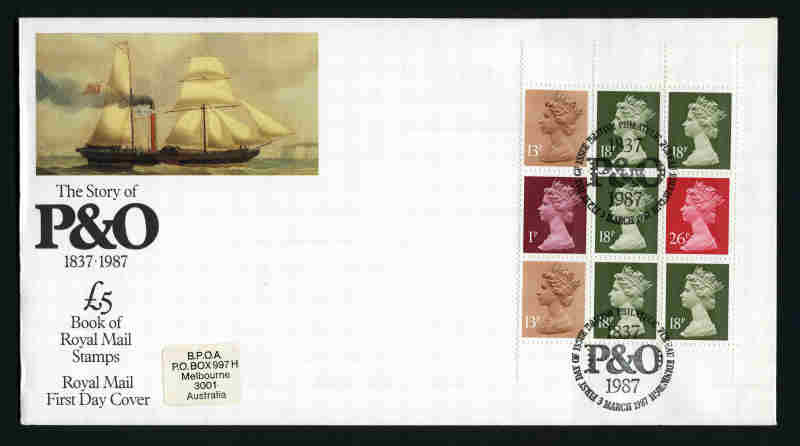 Accumulation of many hundreds official unaddressed FDC's from 1977 including some Frama sets and a range of Australian Antarctic Territory, some with base cancels. Face Value $729.00. 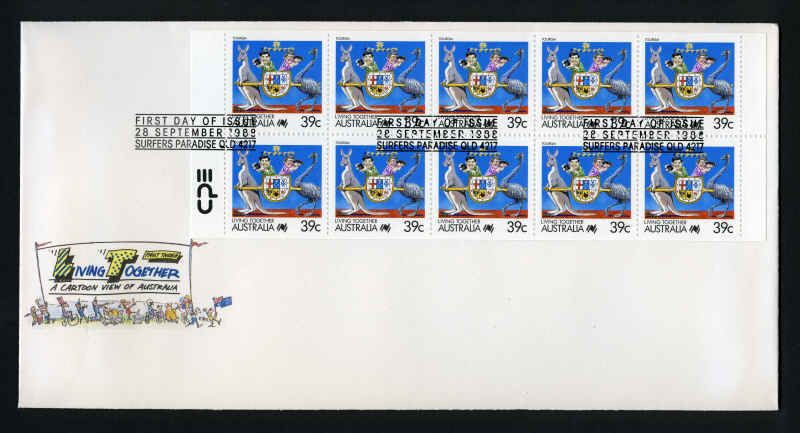 Collection of official unaddressed FDC's from 1978 18¢ Australia Day to 2009 Corrugated Landscapes set including some Joint Issues. Face Value $1,350.00. Accumulation of official unaddressed FDC's from 1977 to 1994 including many duplicates. Face Value $1,532.00. 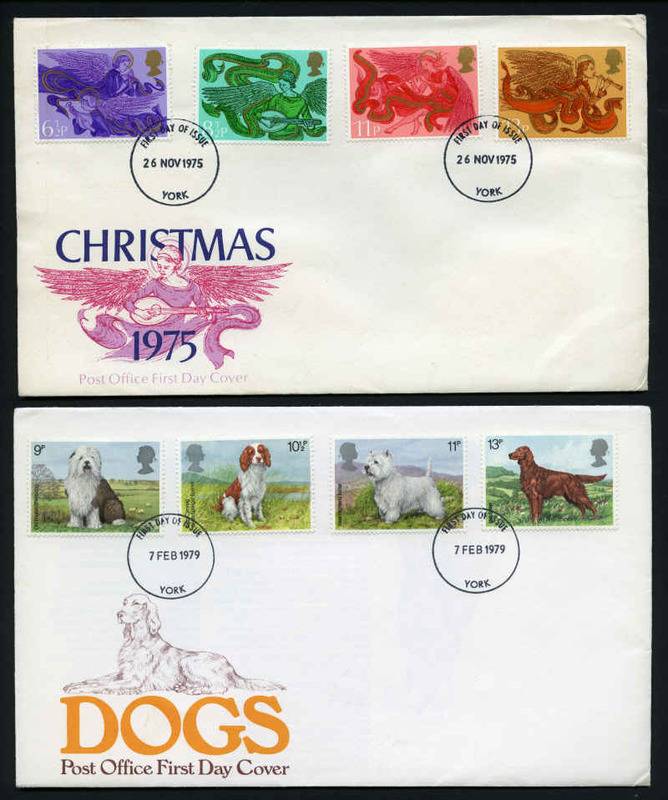 Selection of official unaddressed FDC's from 1974 to 1996. Face Value $163.00. Also 31 earlier FDC's, 88 mint and 85 cancelled on FDI PSE's and 115 other items including Aerogrammes, Special Postmarks and Maximum Cards. 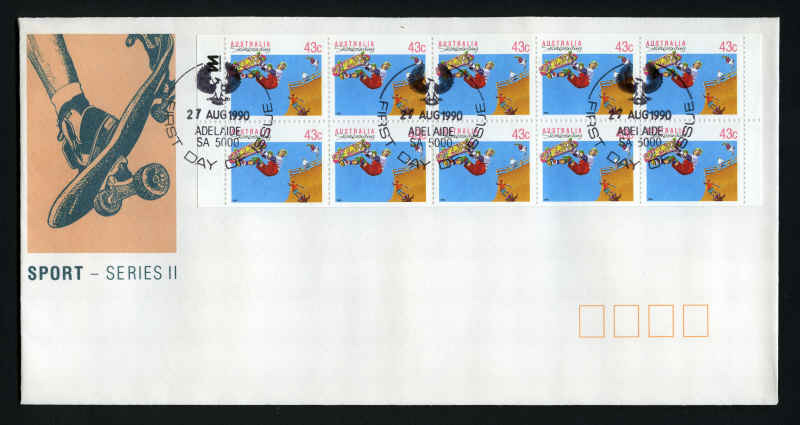 Accumulation of official unaddressed FDC's from 1972 to 1996 including many duplicates. Face Value $595.00. 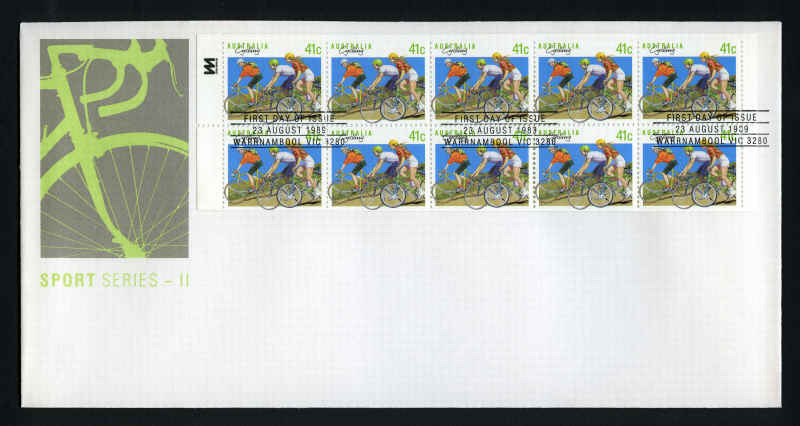 1988 37¢ CPE (42) and Leigh Mardon (37) Living Together, 1988 39¢ Living Together (56), 1989 39¢ Fishing (51), 1989 41¢ Cycling (47) and 1990 43¢ Skateboarding (31) booklet panes on official unaddressed FDC's. Face Value $1,035.60. Accumulation of official unaddressed FDC's from 1992 to 2004 including many duplicates. Face Value $909.85. 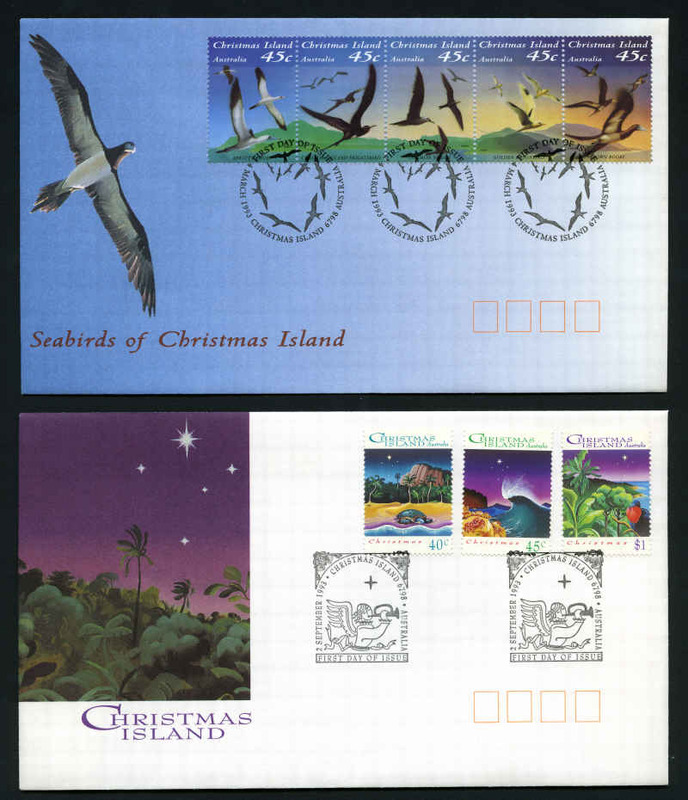 Collection of 576 official unaddressed FDC's from 1994 to 2009 including some Australian Antarctic Territory, Christmas Island and Cocos (Keeling) Islands issues in 7 Australia Post Hagner Sheet type albums. Face Value $1,467.00+. 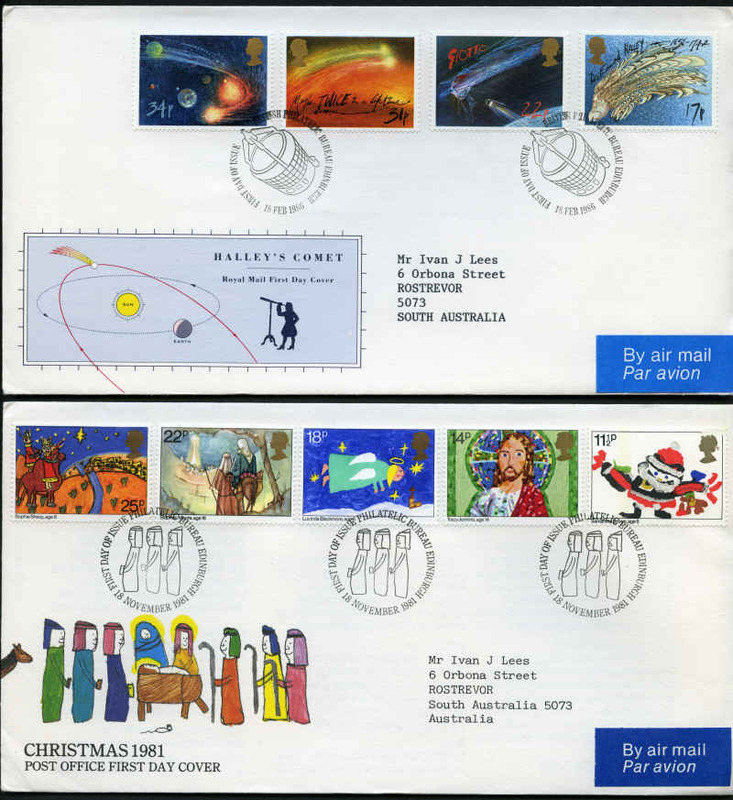 Selection of official unaddressed FDC's from 1996 to 2008 including few Joint Issues and Australian Antarctic Territory. Face Value $521.10. Also small range of Maximum cards. 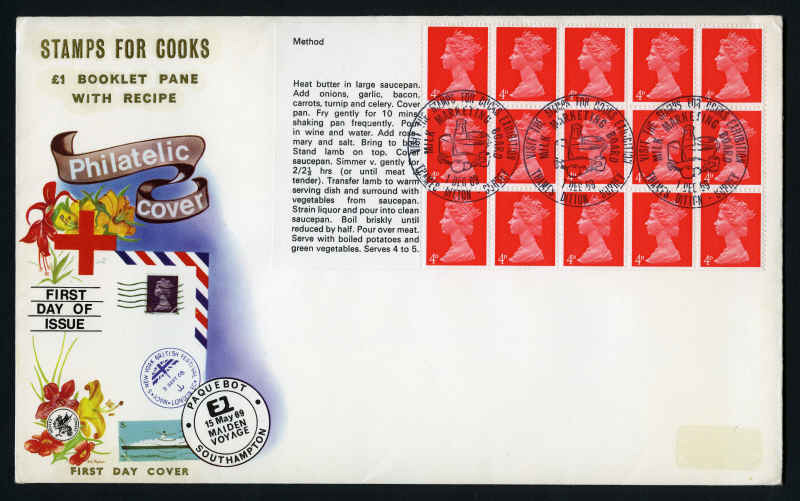 Accumulation of official unaddressed FDC's from 1973 to 2001 including few Joint Issues and PSE's cancelled FDI, plus small range of souvenir covers with special postmarks and miscellaneous items. Face Value $781.00. 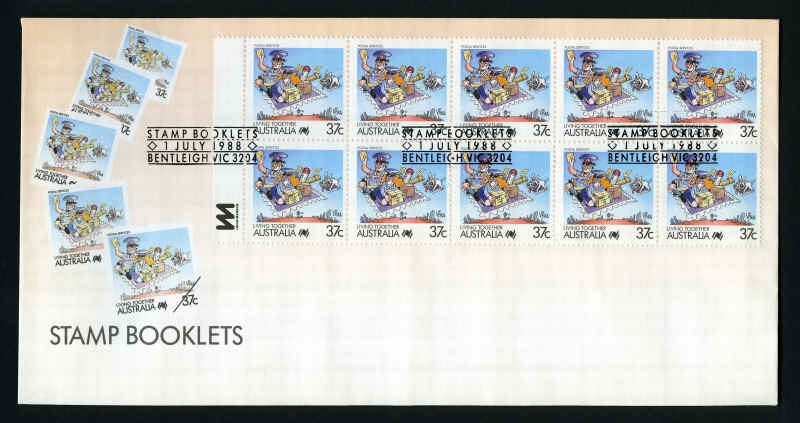 Accumulation of official unaddressed FDC's from 1981 to 1993 including some Australian Antartic Territory, plus 538 PSE's, 34 Aerogrammes and 40 Lettercards mostly cancelled FDI from 1978 to 1993. Face Value $604.00. 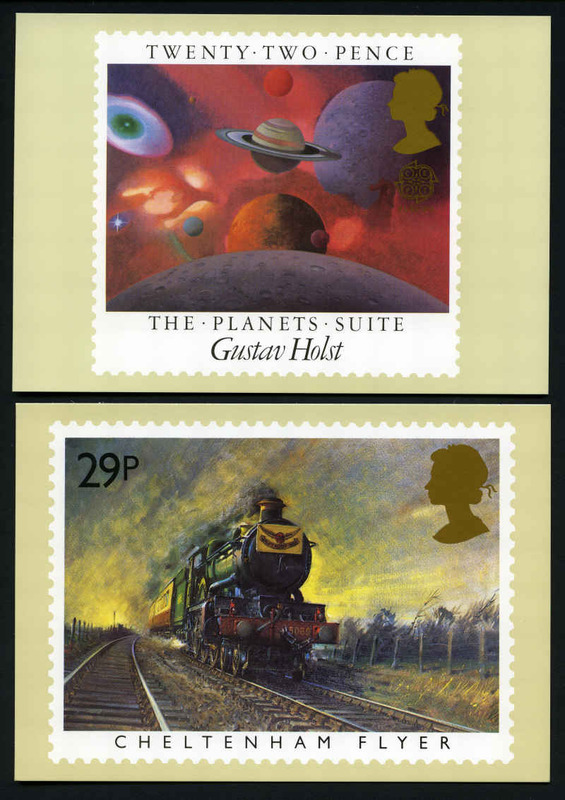 Also 1981 Brown and 1982 Black (2) Postcard packs. Accumulation of official unaddressed FDC's from 1980 to 1988 including some PSE's cancelled FDI and few postal stationary items, plus small range of souvenir covers with special postmarks. Face Value $410.45. Also 1981 25¢ Bilby mint without gum on piece. (500). 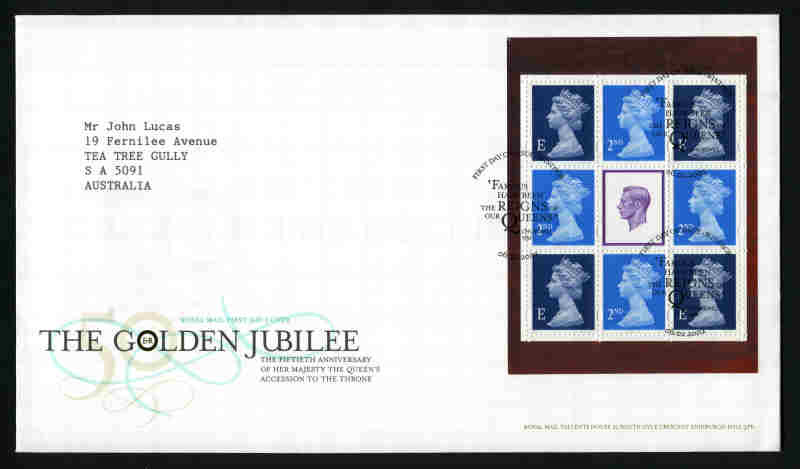 Accumulation of 855 official unaddressed FDC's from 1979 to 2009 including some base cancel sets, blocks of 4 and many duplicates. Face Value $1,457.00. 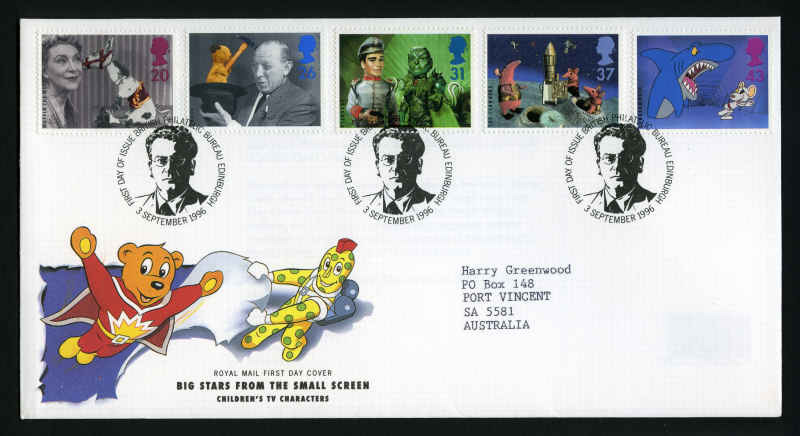 Complete collection of official unaddressed FDC's from 1979 South Pole set to 2000 Mawson's Huts set, plus Australia 1990 Scientific Co-operation in Antarctica set, all in blocks of 4 cancelled at all 4 bases. 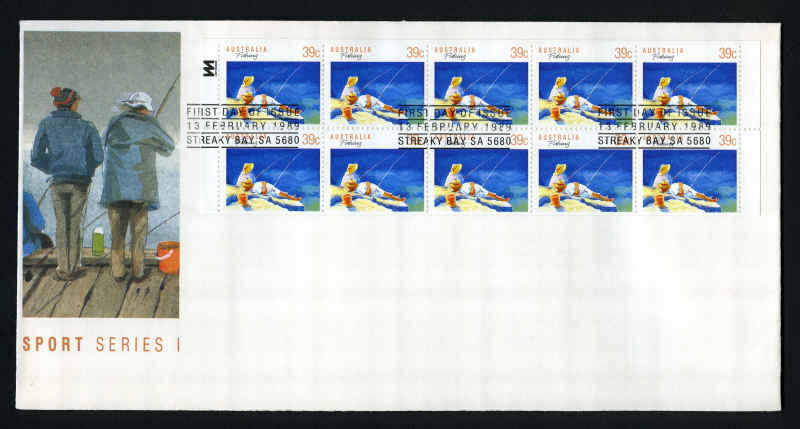 1983 Wildlife and 1988 Environment in strips of 5 and excludes 1995 Whales M/S. Catalogue Value $739.68. Australian Territories and Papua New Guinea. 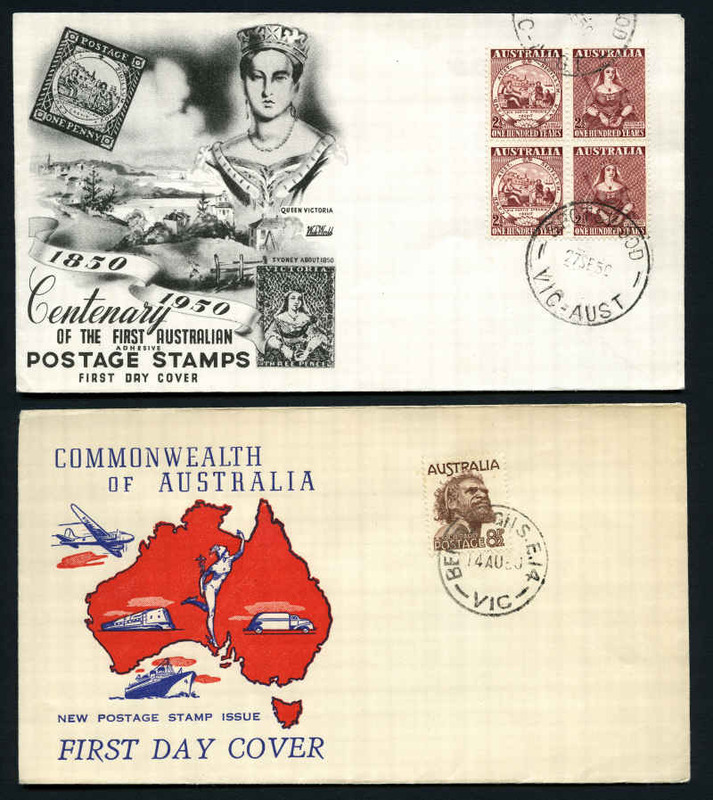 Australian Antarctic Territory, Christmas Is, Cocos (Keeling) Is, Nauru, Norfolk Is and Papua and Papua New Guinea selection of 334 FDC's, postal stationary and miscellaneous items from 1937 to 1992 including AAT 1966 Definitive set cancelled at Mawson, Wilkes and Macquarie bases on official Australia Post logo FDC's, 1973 Definitive set on official unaddressed FDC's cancelled at Mawson base (4 sets), 1971 Treaty set on official unaddressed FDC's cancelled at all 4 bases (2 sets), Christmas Island 1958 QEII Definitive set, Cocos (Keeling) Islands 1963 Definitive set (4), Norfolk Island 1947-59 Ball Bay set of 14 (2), 1960 2/8 Local Government, Papua New Guinea 1962 Malaria set (3), 1962 Pacific Games set (3) and more. Odd minor blemish and varying duplication. Accumulation of 283 official unaddressed FDC's from 1969 to 1992, plus 54 Aerogrammes including many duplicates. Face Value $540.26. Accumulation of official unaddressed FDC's from 1993 to 2009 with some duplication. Face Value $726.60. 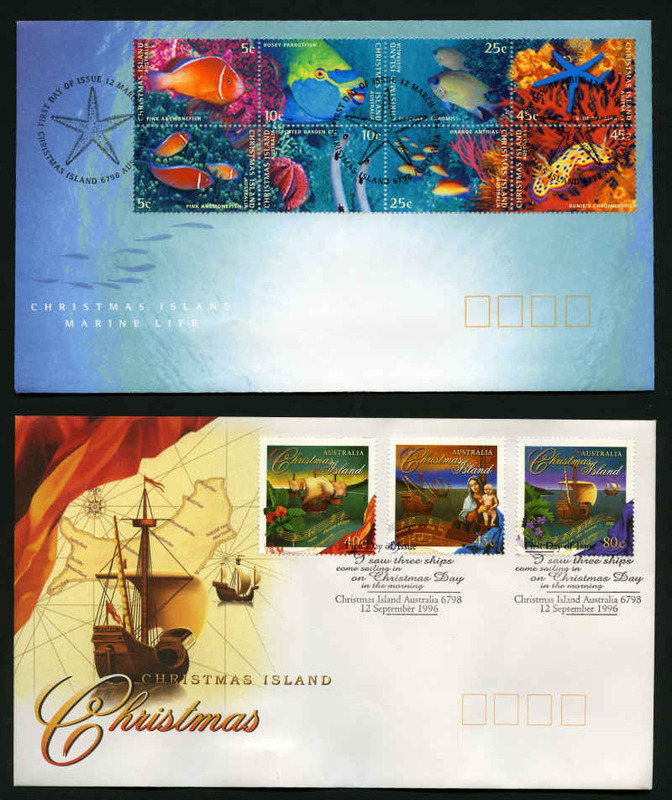 Christmas Island and Cocos (Keeling) Island. 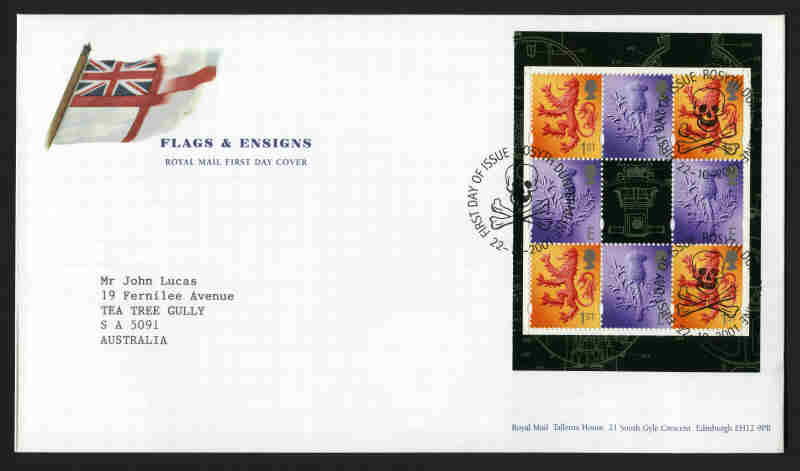 Selection of official unaddressed FDC's from 1993 to 2007 with some duplication. Face Value $449.50. 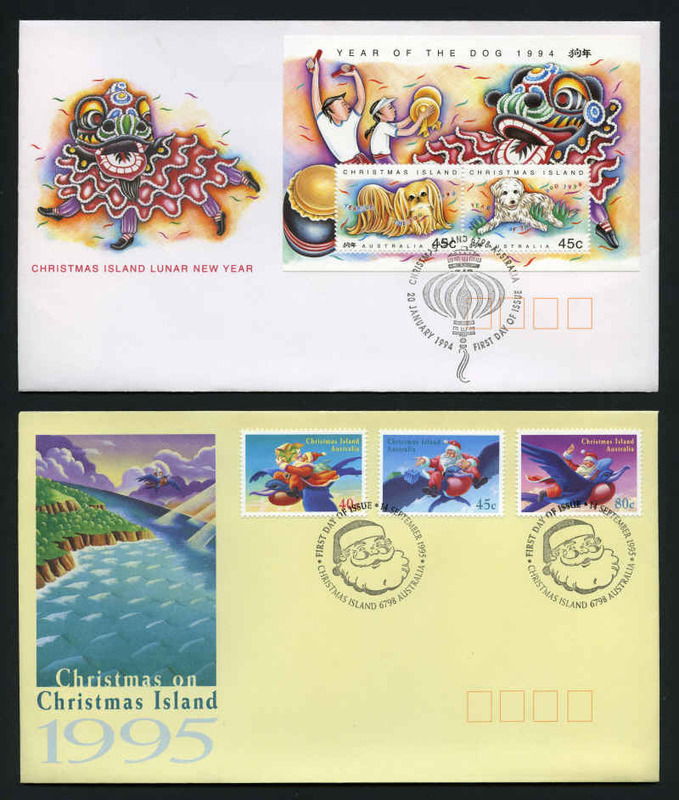 Largely complete collection of official unaddressed FDC's from 1993 to 2009. Face Value $225.35. 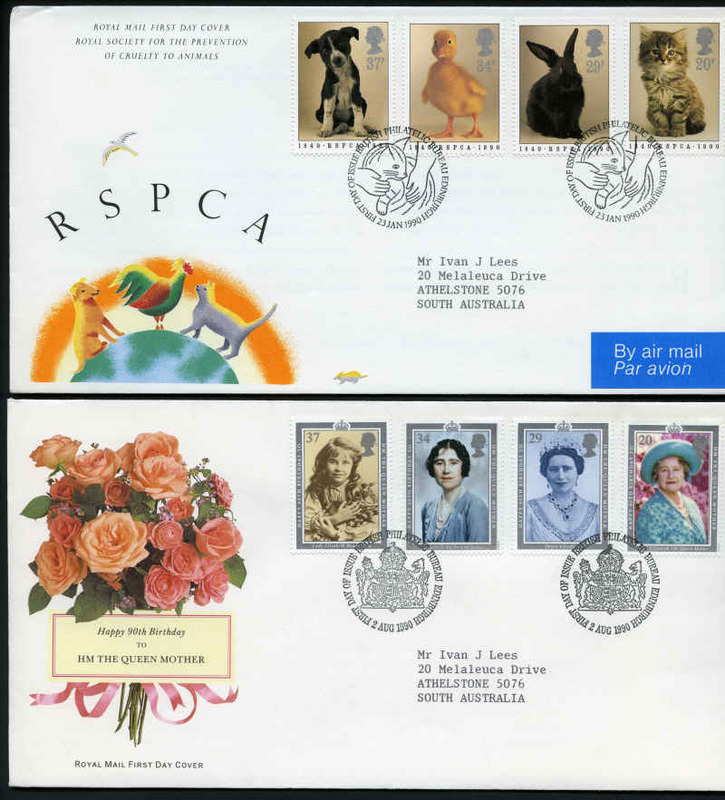 Selection of official unaddressed FDC's from 1994 to 2008 with some duplication. Face Value $349.00. Accumulation of 88 official unaddressed FDC's, 754 Pre-Stamped Envelopes, 83 Aerogrammes and 14 Maximum cards from 1981 to 2004. Varying duplication. Face Value $496.00. Accumulation of 771 official unaddressed FDC's, 369 Pre-Stamped Envelopes and 63 Aerogrammes from 1967 to 2004. 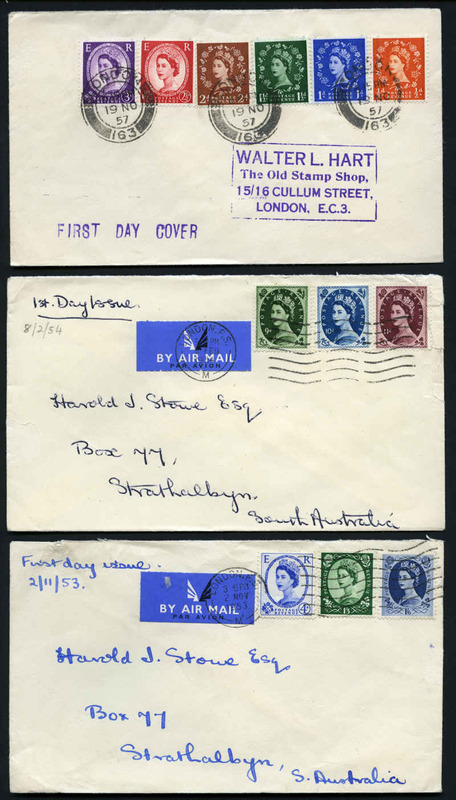 Odd early cover typed addressed and varying duplication. Face Value K1,394.00. 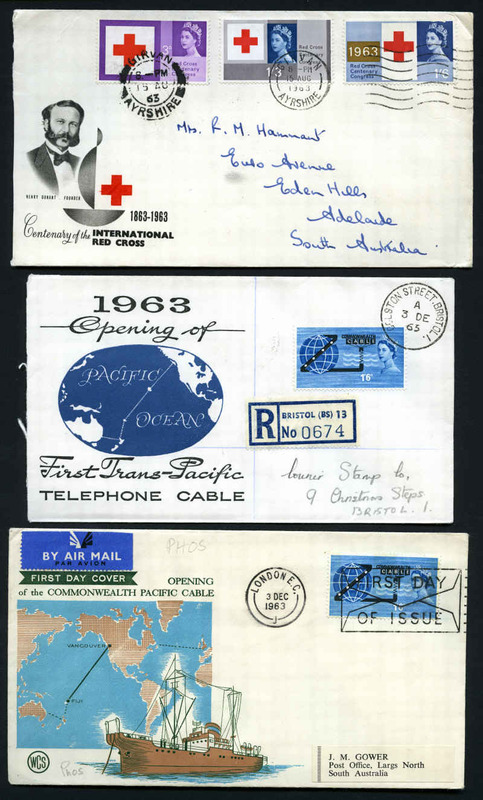 Selection of 277 mainly official unaddressed FDC's from 1946 to 2002 including Fiji, Kiribati, Pitcairn Is, Samoa, Solomon Is, Tokelau, Tuvalu and Vanuatu. 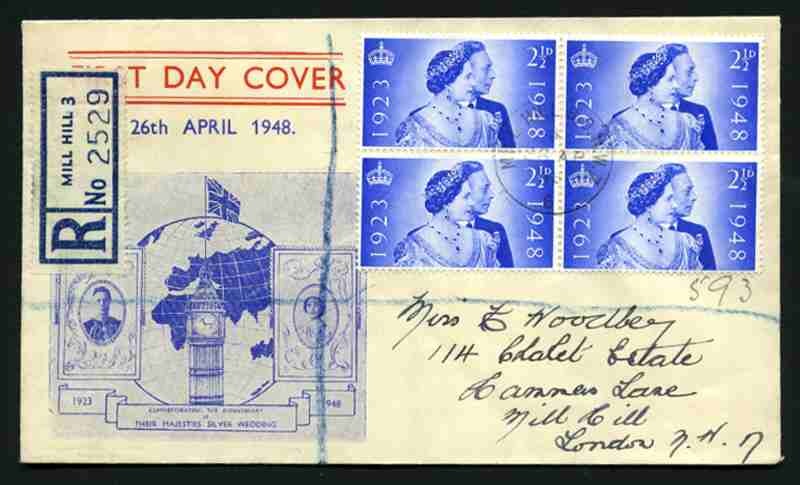 Noted Pitcairn Is 1949 UPU set on addressed illustrated cover. Odd duplicate and minor blemish. 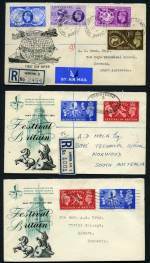 Selection of 267 First Day Covers from 1936 to 1975 including a few special postmarks and postal stationary items. 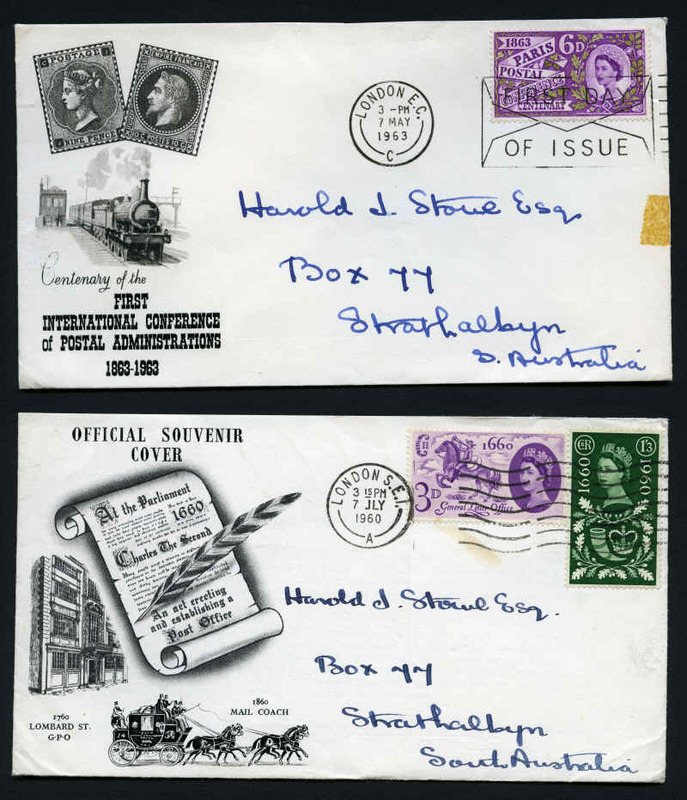 Many official unaddressed covers with some light duplication. Odd fault. 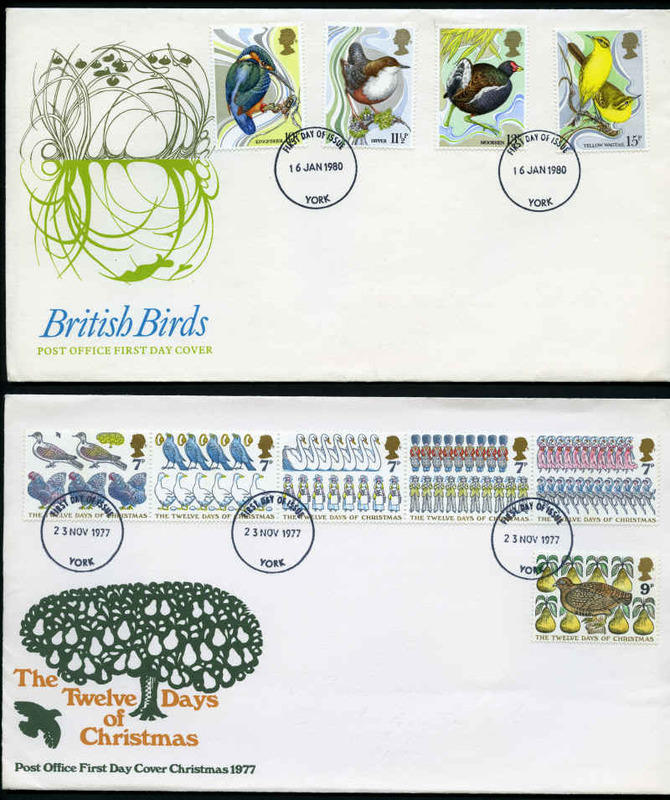 Accumulation of official unaddressed FDC's from 1969 to 2004 including some Ross Dependency, Joint Issues and range of Maximum cards. Some duplication. Face Value NZ$1,840.00. New Zealand and Pacific Islands. 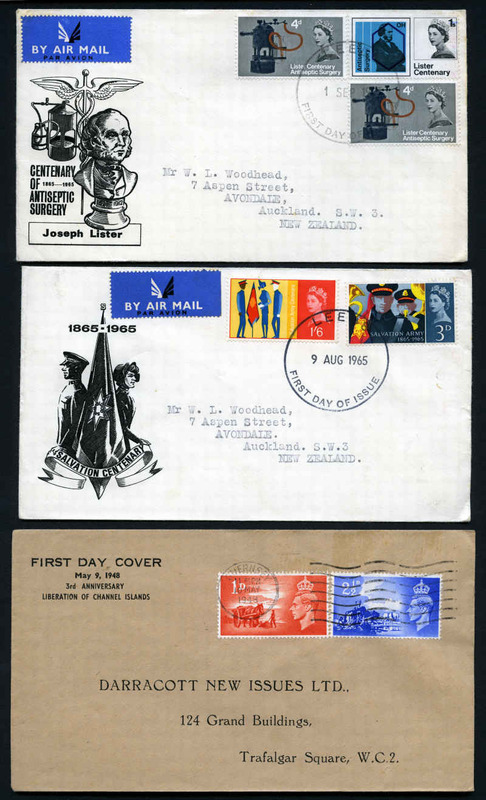 Selection of 494 First Day and souvenir covers from 1936 to 1990 including special postmarks, Frama covers, Ross Dependency and postal stationary items. 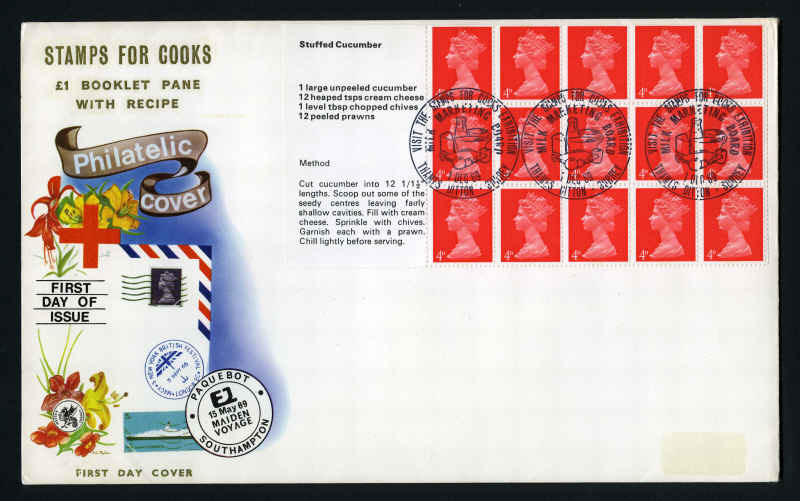 Noted 1950 plain cover franked with 5d KGVI tied by Raoul Island/Kermadec Islands CDS, 1967 Definitive set of 18 on plain FDC, and 1969 Ross Dependency 1967 Decimal Definitive set on cover tied by Scott Base CDS. 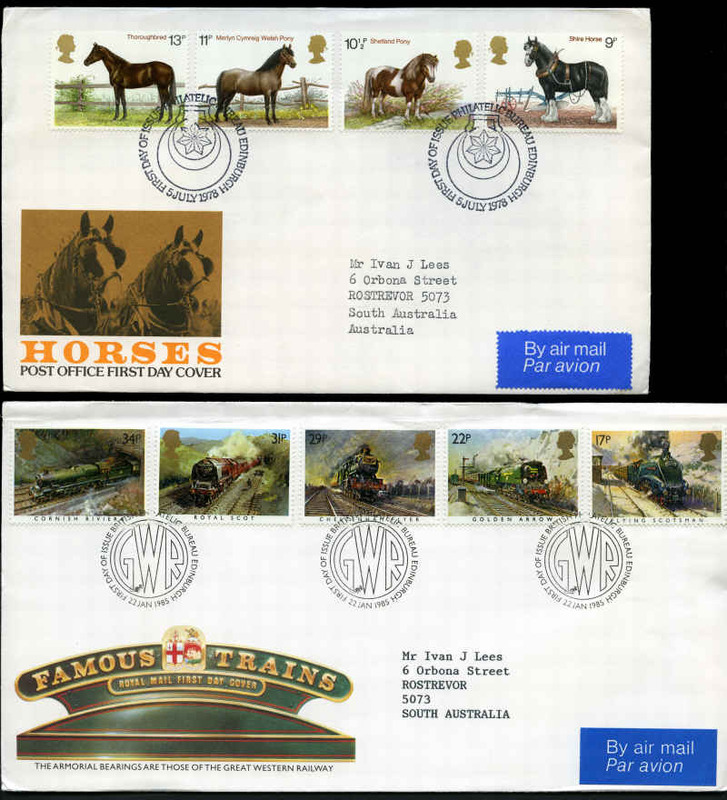 Mainly illustrated addressed covers with some light duplication. Odd minor blemish. 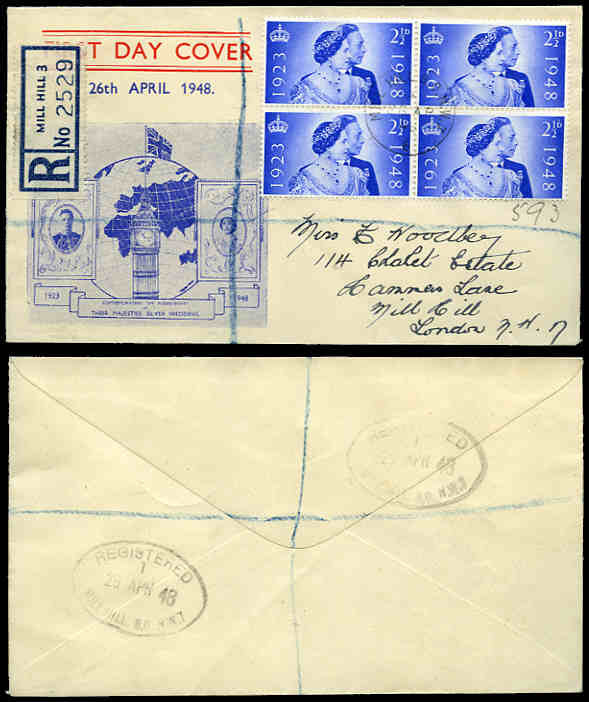 1948 Royal Wedding set on 2 illustrated registered FDC's. Retail $595.00. 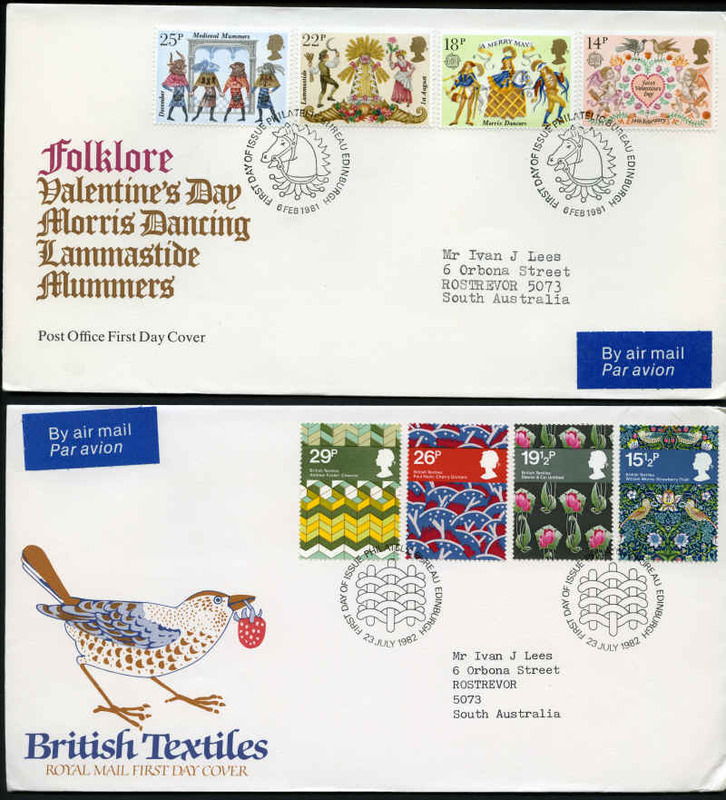 Selection of 457 mainly addressed illustrated FDC's from 1937 to 1998 including range of souvenir covers with special postmarks and mint PHQ cards. 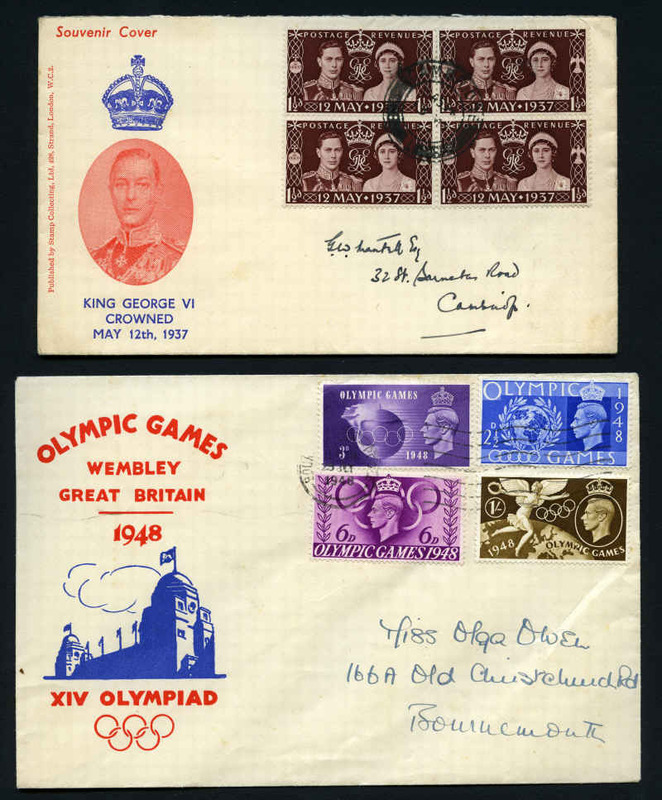 Noted 1953 Coronation set (4), 1957 Scout Jubilee set (3), 1962 National Productivity Year Phosphor set and 1968 European Cup Final commemorative cover signed by Bobby Charlton. Some minor blemishes and duplicates. 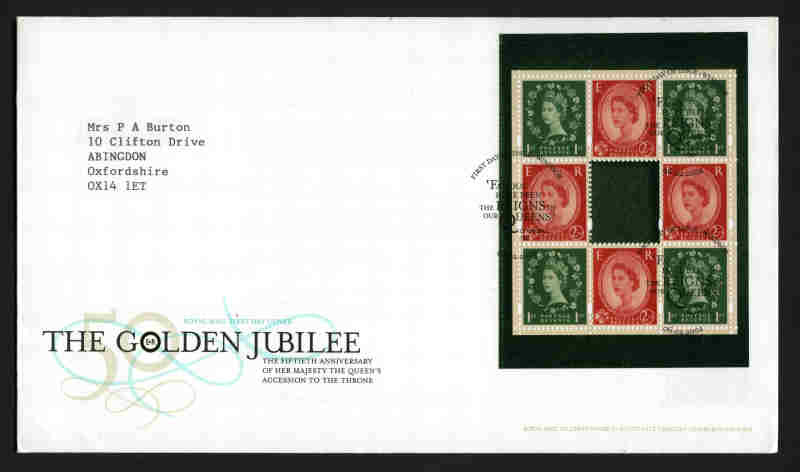 Also 1890 Post Office Jubilee envelope and 1892 1d Carmine on Blue Queen Victoria Lettercard mint. 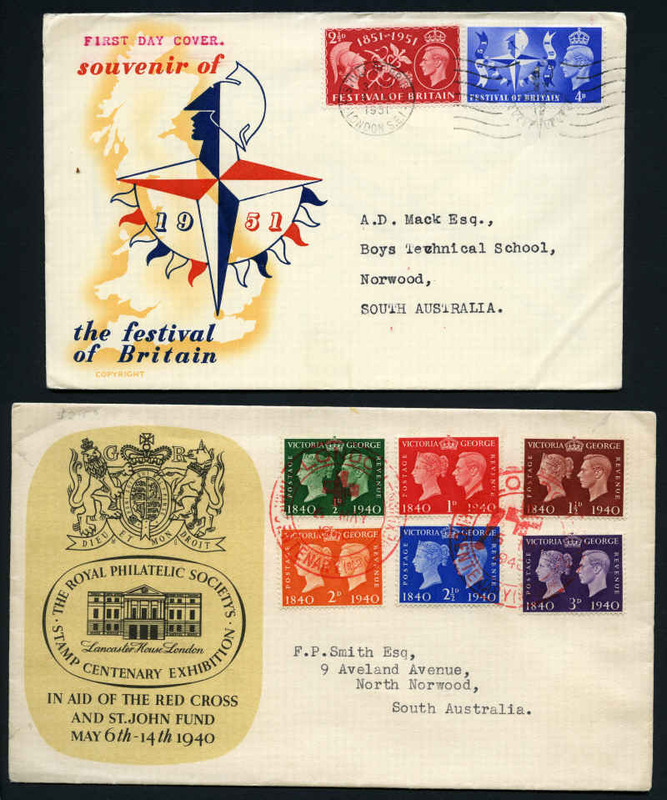 Collection of 90 illustrated FDC's from 1937 to 1970 including 1940 Stamp Centenary set, 1948 Olympic Games set (2), 1949 UPU set and largely complete simplified Commemoratives from 1951 Festival of Britain set to 1970 Christmas set, but includes some Phosphor sets, booklet panes and Definitive issues. Odd minor blemish. Catalogue Value $3,100.00+. 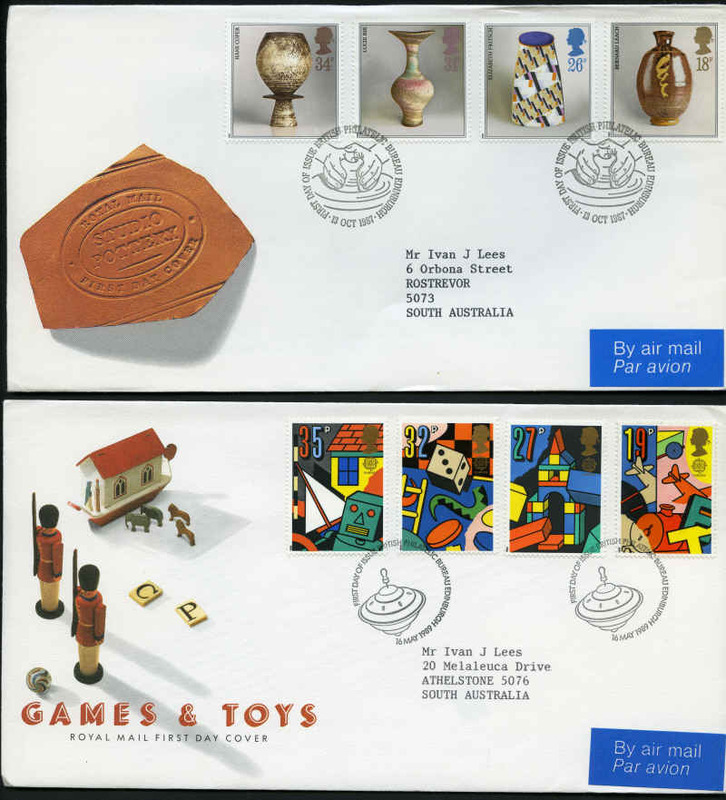 Selection of 23 mostly plain FDC's from 1948 to 1966 with many highly catalogued items. 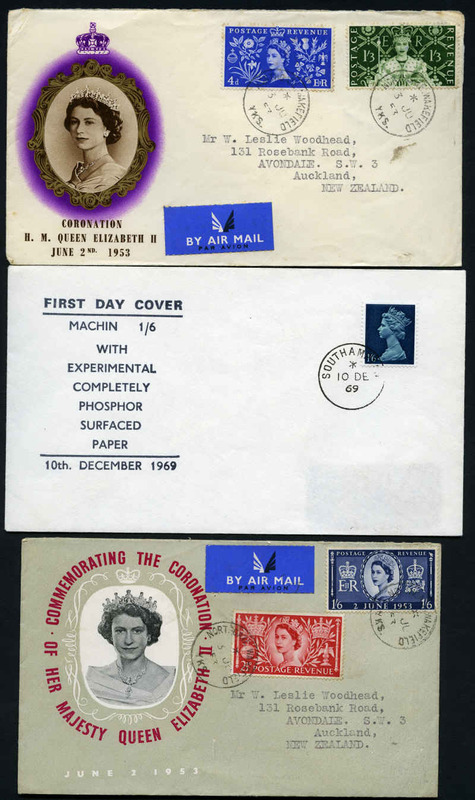 Noted 1952-54 St. Edwards Crown Wmk QEII Wildings set excluding ½d, 1d and 2d values on plain FDC's. Odd fault. Catalogue Value $2,600.00+. 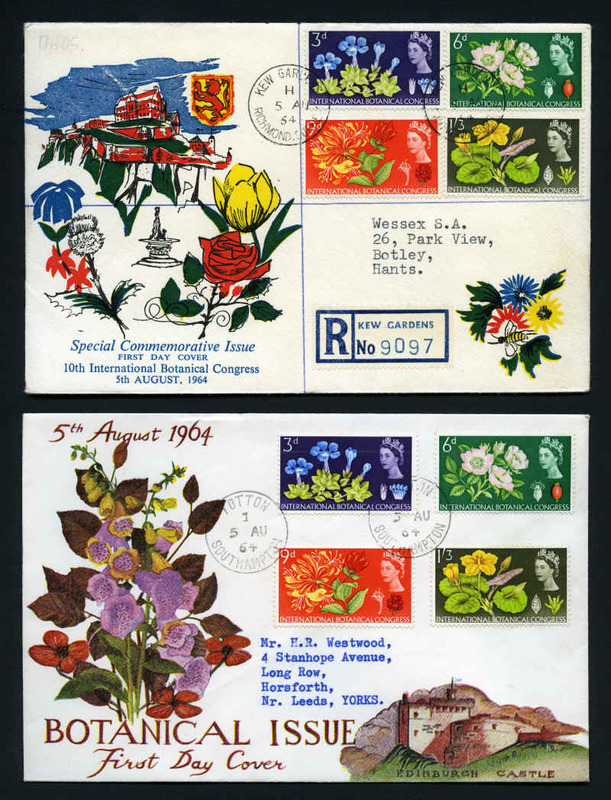 Selection of 79 mostly illustrated addressed FDC's from 1958 to 1970 including several early Phosphor sets. Odd blemish. 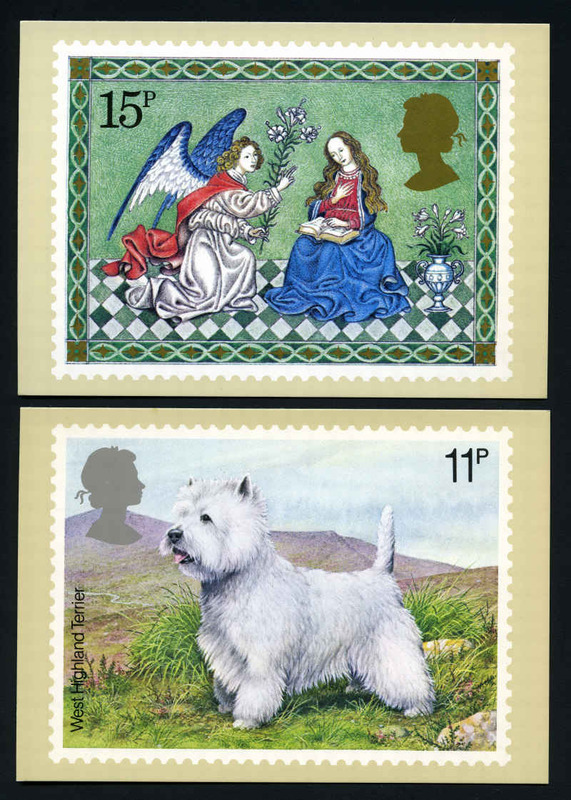 Also duplicated range of 700 used stamps from 1953 to modern with varying duplication in small stockbook. 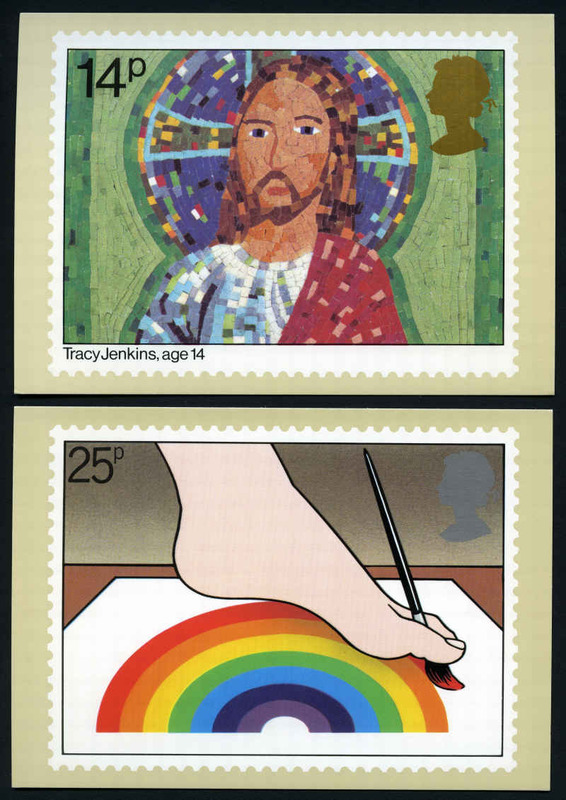 Largely complete collection of 385 commemorative FDC's from 1971 to 1997 Religious Anniversaries set including most Definitive issues, booklet panes and some Regional issues. Majority neatly addressed with some duplication. Odd minor fault. Face Value $825.00. 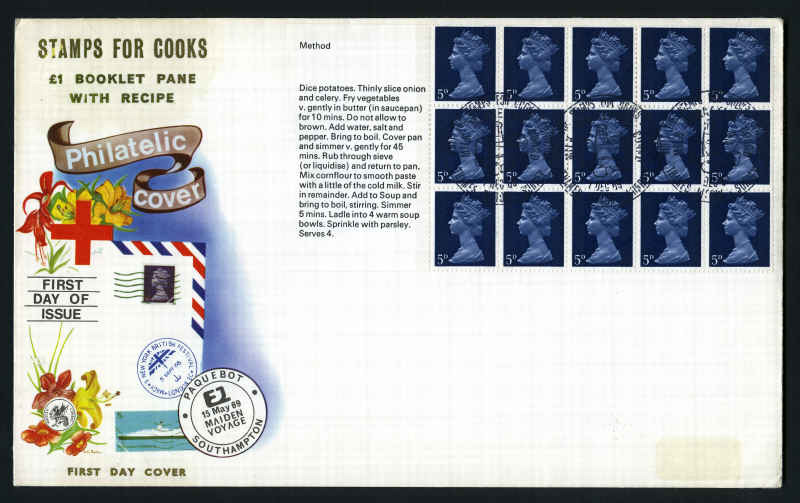 Selection of 22 different Prestige definitive booklet pane FDC's from 1969 to 2002 including 1972 Wedgewood booklet pane containing scarce ½p Blue Machin Head with 1 side band at left. Retail £120.00. 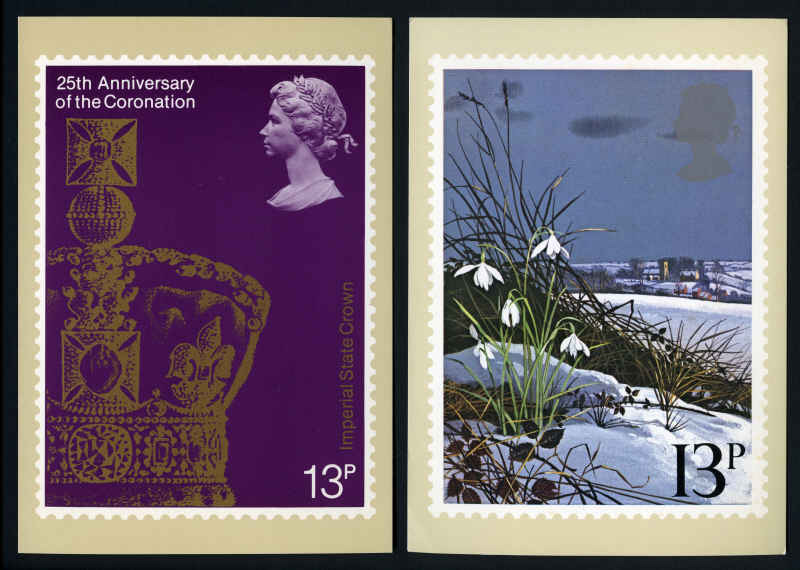 Largely complete collection of 81 official commemorative FDC's from 1970 Rural Architecture set to 1980 Christmas set, plus 175 mostly mint PHQ cards from 1976 to 1988. 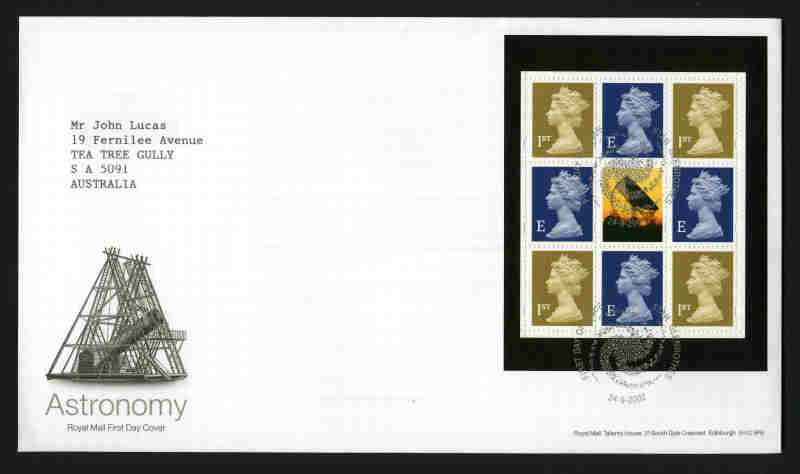 FDC's with faint rubbed out pencil address. 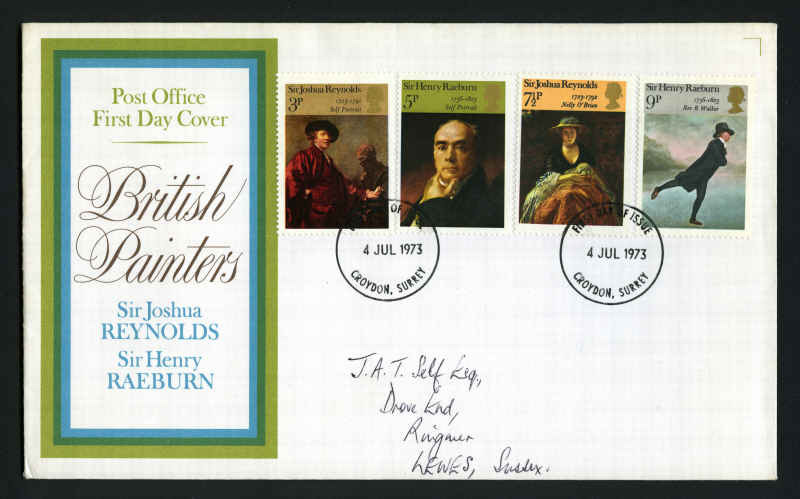 Largely complete collection of neatly addressed official FDC's from 1974 Paintings set to 1990 Queen Mother Birthday set including odd duplicate, plus few Definitive issues to 1999. Face Value $238.00. 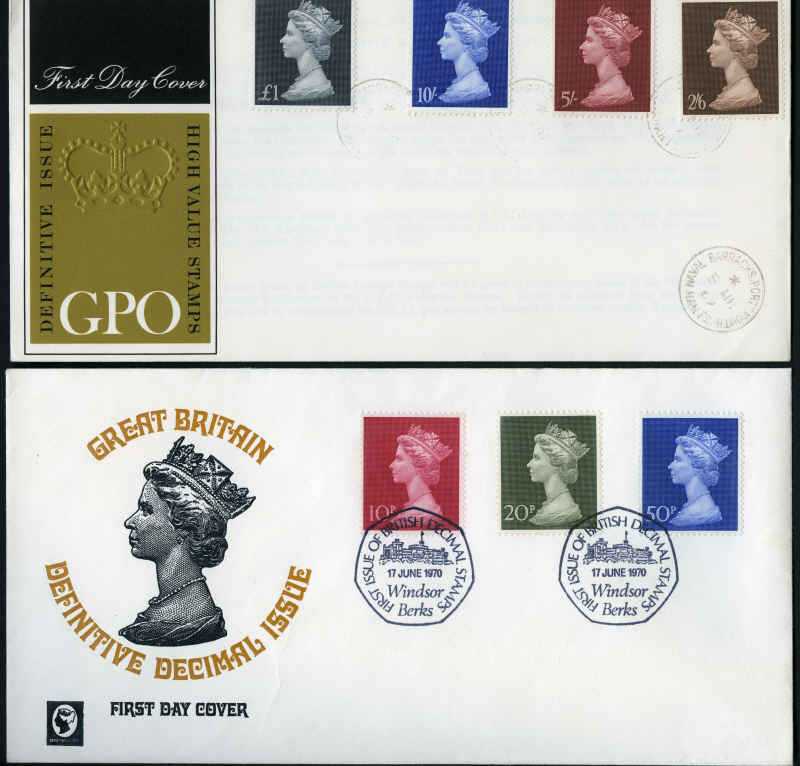 Also small range of Pre-Decimal FDC's from 1963 to 1969 including few higher catalogued items. 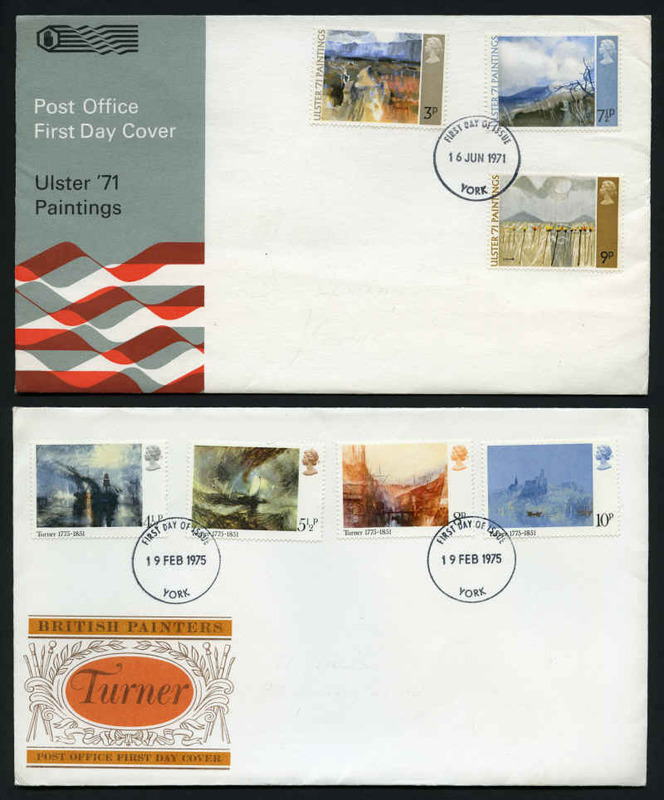 Selection of 204 illustrated FDC's from 1965 to 1979, some with light toning or minor faults. High Face Value. 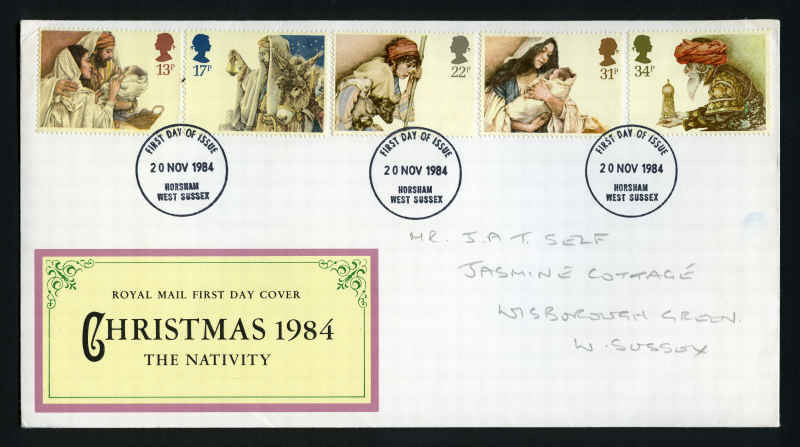 Largely complete collection of official FDC's from 1974 Christmas set to 1991 Ordnance Survey set with neat typewritten addresses. Face Value $317.00. 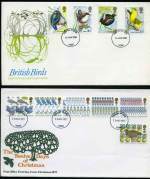 Collection of 204 different illustrated Decimal FDC's from 1971 to 1998 including some highly catalogued high value Definitive issues. Face Value $528.00. 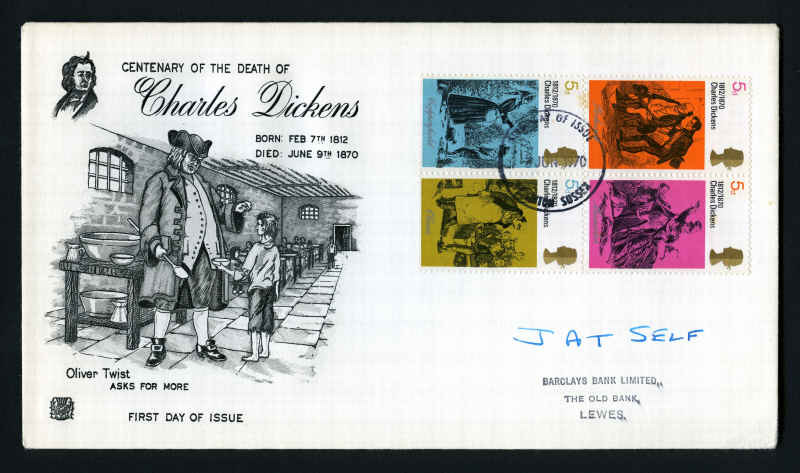 Also 56 mostly Pre-Decimal FDC's. 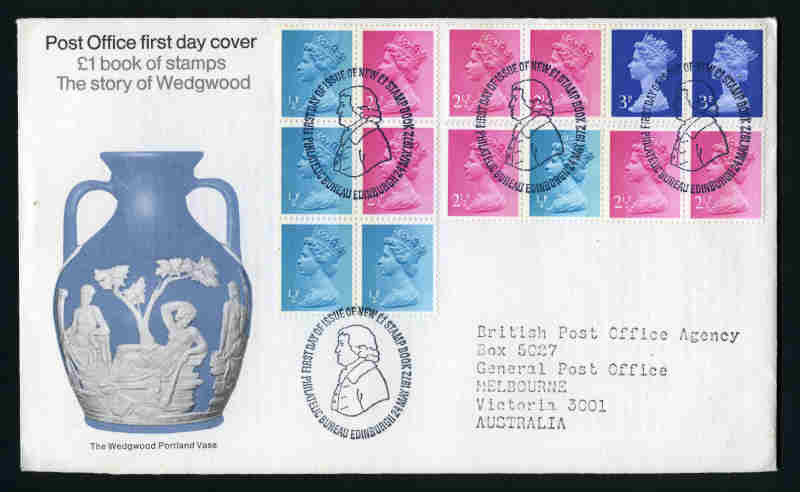 Collection of 2,203 mostly Fleetwood illustrated FDC's from 1972 to 2009 including some postal stationary and souvenir covers. 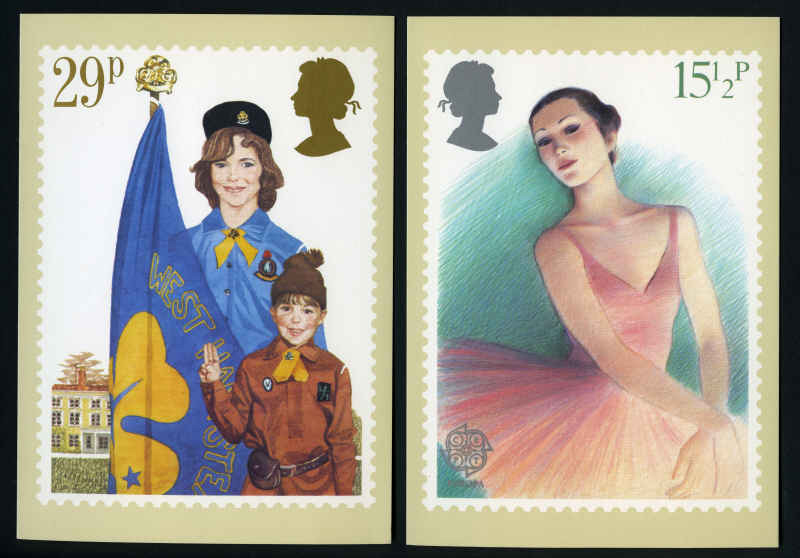 Largely complete from 1991 onwards with some light duplication. Huge cost price. 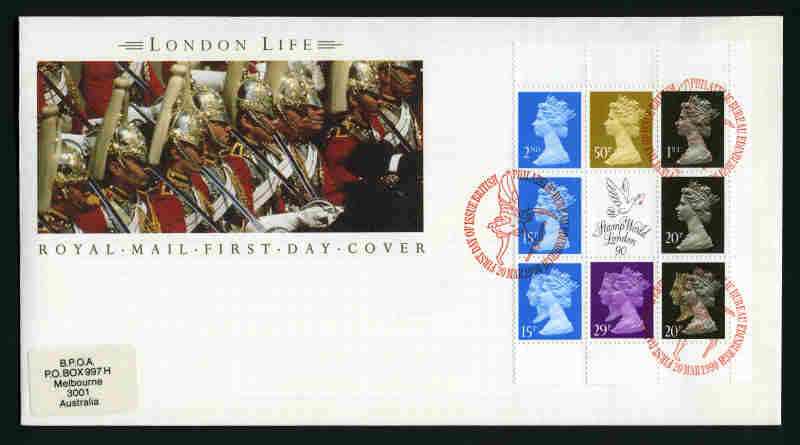 14 empty Cumberland FDC albums, with Brown, Burgundy, Blue and Green covers each containing 20 mainly size 2 pages in very good condition.